Here in Rhode Island, we have access to amazing seafood year-round. My friend, Gary, is a lobster man. My neighbor farms oysters. 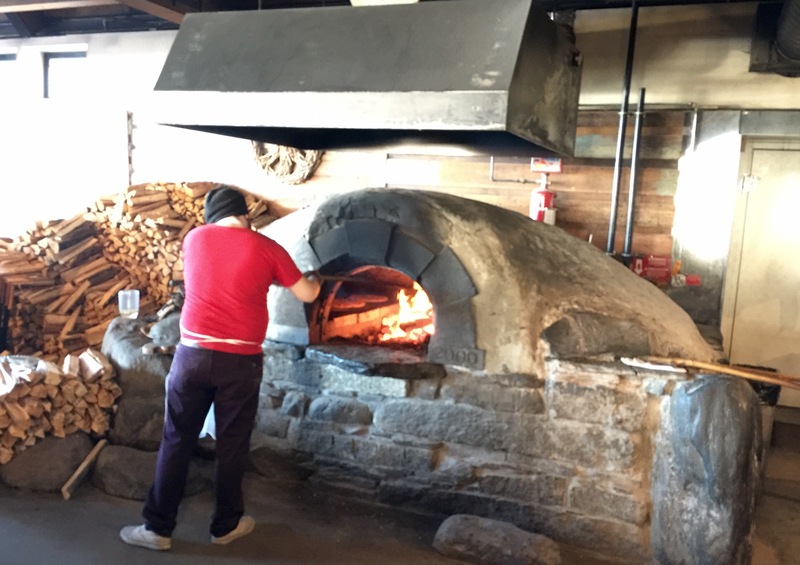 And for anything else, the Aquidneck winter farmers’ market at Newport Vineyards in Middletown is a great place to pick up veggies, bread, pasture-raised meats from local farmers, and freshly caught seafood. 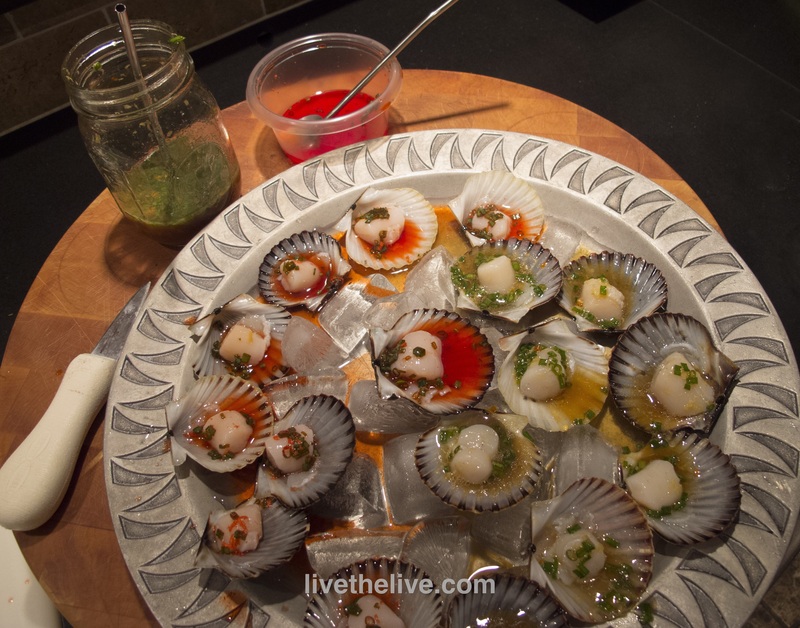 There are two marinades that I use when serving up raw scallops. The acidity in these marinades will cook the scallop a little, like in ceviche. The first place my wife and I ever had a raw scallop was at Mills Tavern, in Providence, RI. Freshly shucked scallops (in large flat shells) were served on ice with a tangy red marinade. We never got the recipe from the restaurant, but this is our version of that marinade. 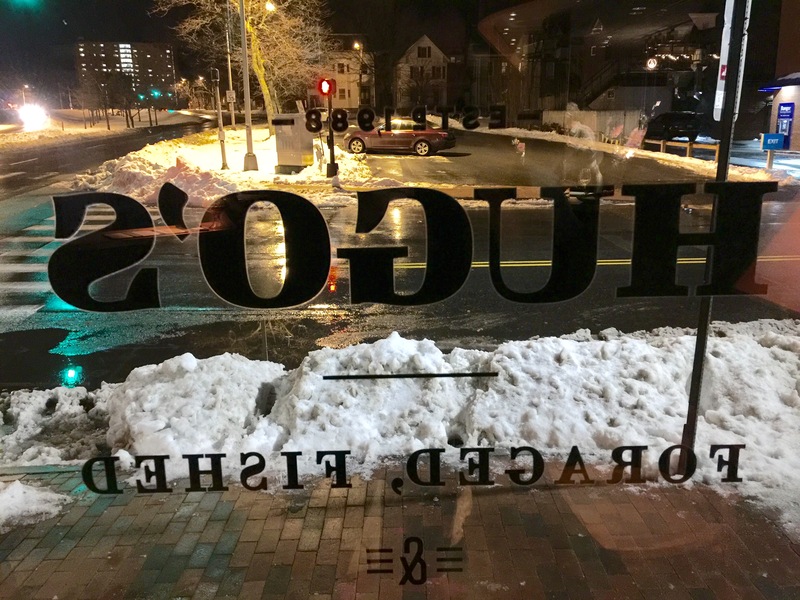 It’s mind-blowing how many new and exciting restaurants keep popping up in Portland, Maine, and even more interestingly, how they’re all thriving! With a great arts scene, historic New England waterfront, and a young crowd eager to spend their money, Portland is just exploding. I work in Providence, Rhode Island, a city whose food scene has had a lot of attention in the last few years in a variety of national magazines. But really creative restaurants here are hard to find, perhaps five in the entire city. In Portland, you’ll find five on one block! Portland is big enough to be a destination, and small enough that you can park your car once and walk everywhere you want to go all day and into the night. Three of the best restaurants in town just happen to be owned by the same three guys: Andrew Taylor, Arlin Smith and Mike Wiley. They called their company AMA LLC, though now I think they go by the name Big Tree Hospitality. 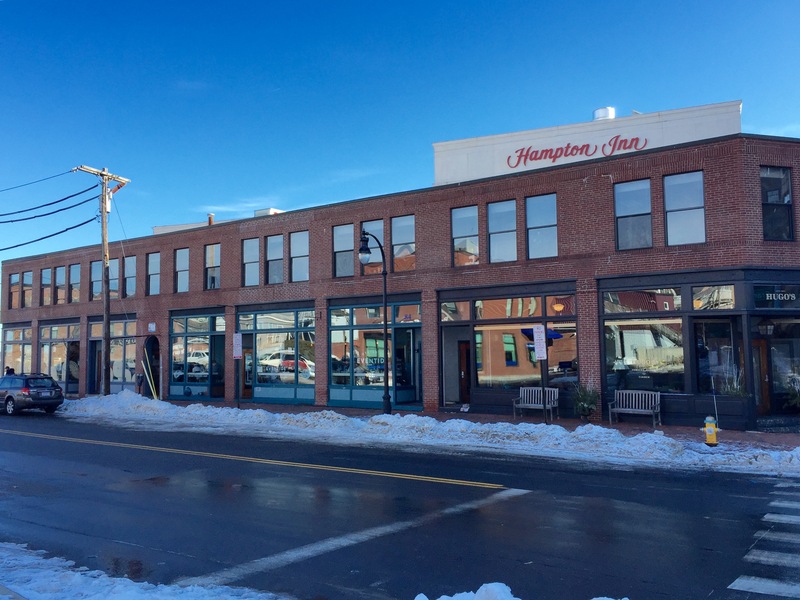 All three restaurants are located right next door to each other on Middle Street: Hugo’s, Eventide, and The Honey Paw. If you go nowhere else in Portland, hit this one block. If you’re just passing through for lunch, it’s right off 295. Just take the Franklin Street exit. The block. From left to right: The Honey Paw, Eventide, and Hugo’s. And if you stay at the Hampton Inn, like we did, you walk less than a block! Our love of Portland started years ago with Eventide, an oyster bar serving the freshest and most creative small seafood plates in the city: a killer brown butter lobster roll, tuna crudo that rivals the best sushi anywhere, blackboard special plates like char tartare, and a dozen oyster choices served with inventive accouterments, our favorite being the pickled red onion ice. Our non-seafood-eating daughter loved the buttermilk fried chicken bun and Eventide burger. And probably the most ignored-but-shouldn’t-be entry on the menu is the fish sandwich: best you ever had or I’ll eat it for you. They use pieces of fresh-caught hake, a fish that’s somewhat unknown unless you’re a local. 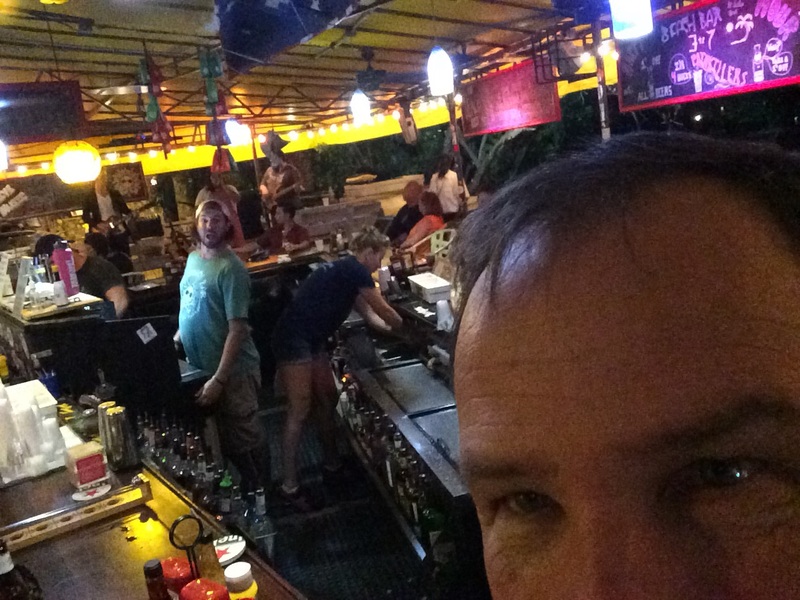 A full bar and a surprisingly friendly staff, despite the fact they’re jamming all day long. 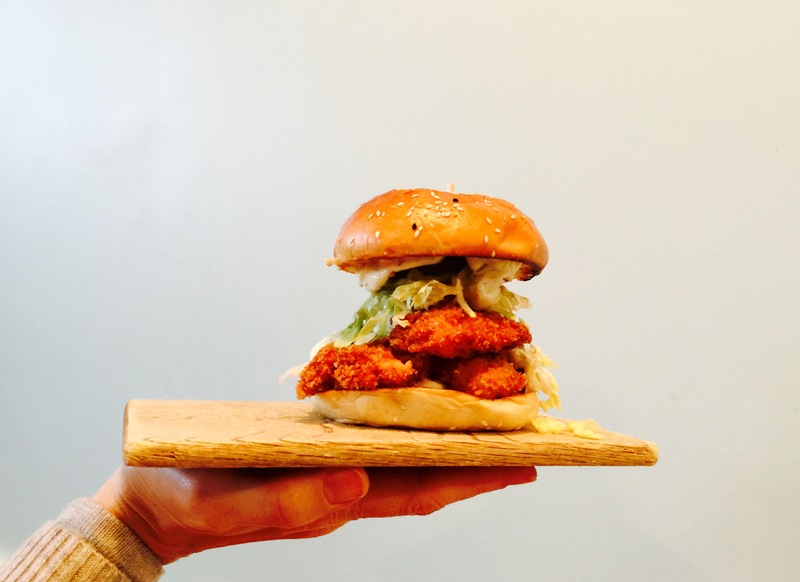 The amazing fish sandwich at Eventide. 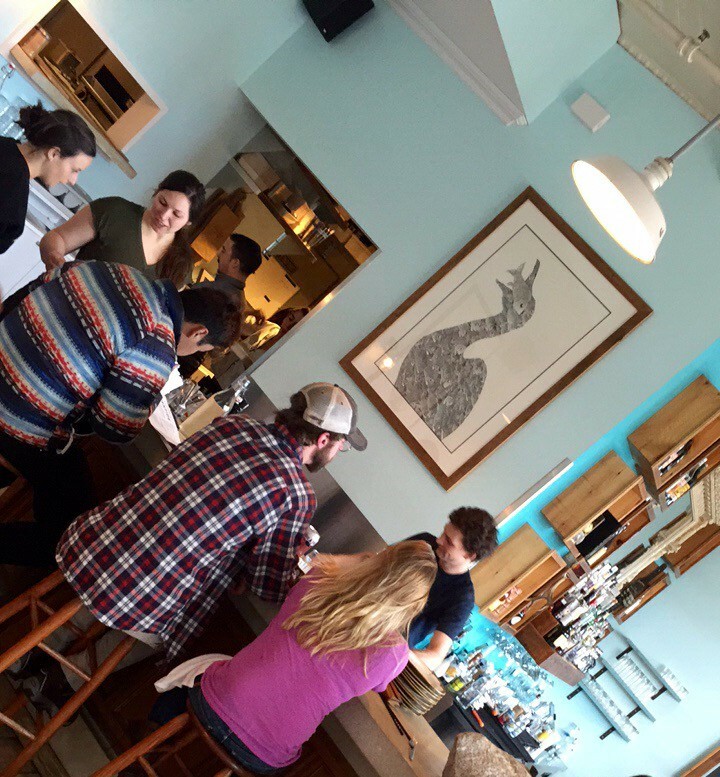 Hugo’s made Portland a food destination thanks to its previous chef/owner, Rob Evans, who sold it in 2012 to concentrate on his newer joint: Duckfat. The three guys: Taylor, Smith, and Wiley, worked there before it closed down and they grabbed the opportunity to take over, bringing a cutting-edge American menu served over a series of exciting tasting courses. Whether you’re a carnivore, vegetarian or seafood lover, you’ll find some wonderful choices here. Our night featured raw and cooked beef selections, lamb bolognese, ankimo (monkfish liver) and unusual veggie plates like sunchokes and smoked parsnips. Paul, the bartender, is a mixologist of the finest kind. 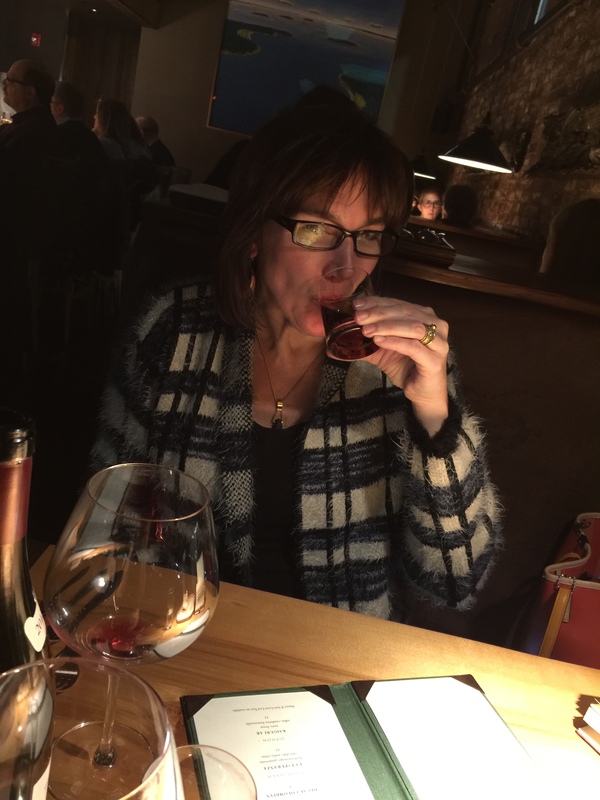 My wife sipped on a Jasmine Fizz before we plunged into the eclectic and inspired wine list chosen by Big Tree Hospitality’s wine director, Brian Flewelling, who happened to be our server that night. My wife enjoyed a sip of my Pappy’s as well. And it didn’t hurt that they had three kinds of Pappy Van Winkle bourbon on their shelves…something I haven’t seen anywhere else. (These are the bottles that go for over $1500 on line.) Needless to say, Paul the bartender and I bonded over a taste of the 20-year-old Pappy. A bourbon conversation between my newest best friend, Paul, and myself. The third and newest restaurant in the group is The Honey Paw, featuring an eclectic Asian menu. The intense flavors come from all over Asia, and we wondered how these young chefs could be so knowledgeable. We found out that the company flies its employees to countries like Singapore and Malaysia on a regular basis to give them the experience they need to create and serve this amazing food. I swear, I wanna work for these guys! I haven’t seen any company anywhere treat its employees with such respect, and all of that trickles down to how they treat the food, the community, and their customers. Beautiful plates at The Honey Paw. Like their other two restaurants, The Honey Paw sources most of its ingredients from local farms. 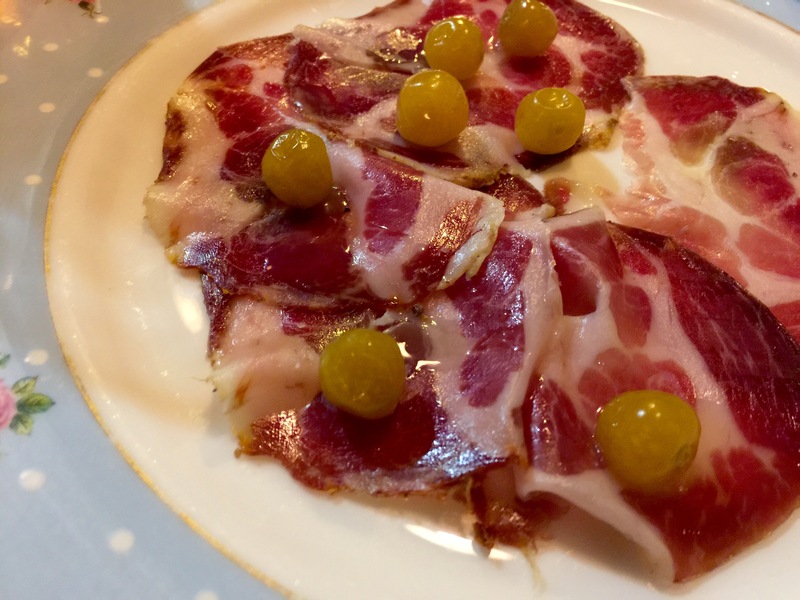 So when we ordered a plate of coppa, it was housemade from rare mulefoot hogs raised in Maine, topped with pickled husk cherries. 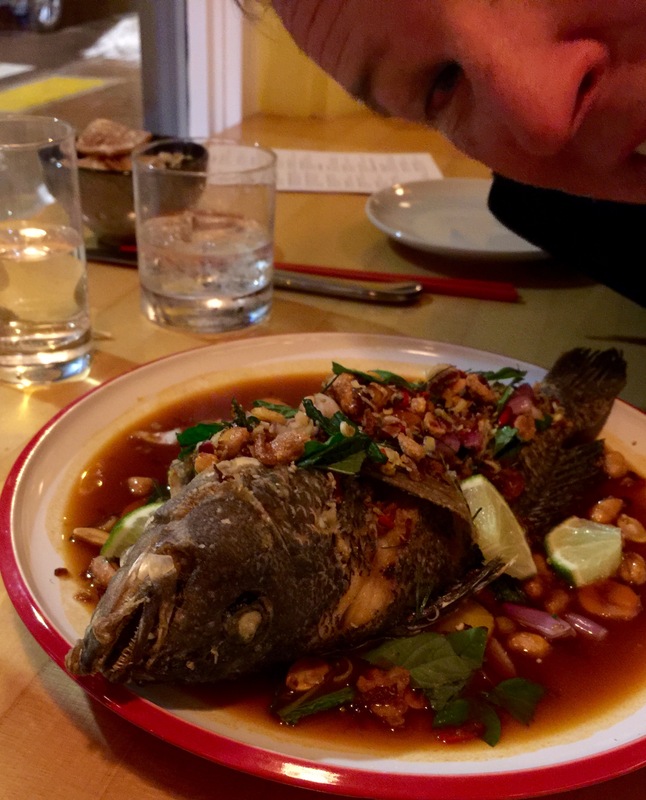 I’m a huge fan of whole-fried fish, but very few restaurants take on that challenge. Even many of my favorite New York Chinese restaurants no longer feature that on the menu. The whole fried black bass I had at The Honey Paw is something I will have every time I return. We did leave the block, eventually! 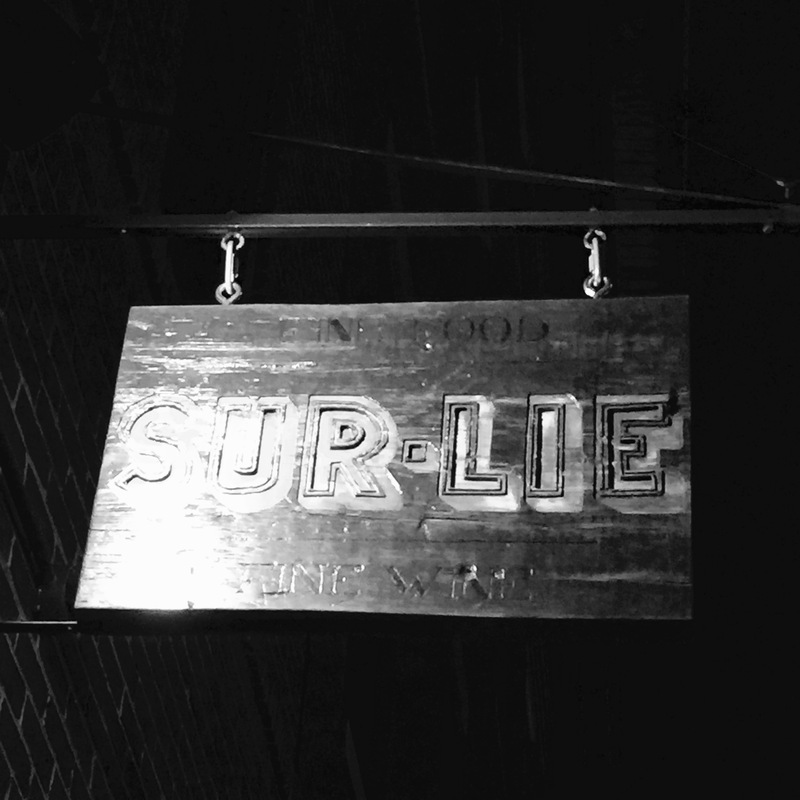 Though not big on atmosphere, Sur Lie was another restaurant in the long list of new establishments in the city featuring small plates full of exciting flavors. We enjoyed tapas like a plate of “Surryano” ham, the West Virginia version of Spanish Serrano…fried milk-braised cauliflower…Hiramasa (Yellowtail Amberjack) crudo…carrot agnolotti (pasta)…and a nicely cooked hanger steak. Good food, good service, and a nice selection of Greek wine. We walked a lot in Portland. Loads of small shops, art galleries, and stores with collectibles. 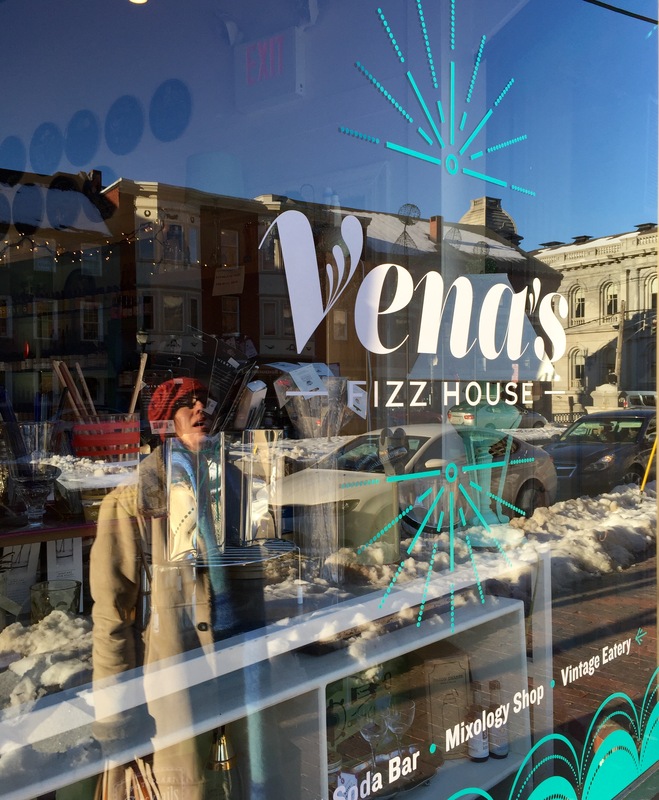 We hit a couple of comic book stores with our daughter, who’s in that phase…art galleries that enticed my wife, the artist…and an unusual shop with rare, collectible barware in the storefront and an actual bar in the back to do some serious sipping: a place called Vena’s Fizz House. Sometimes we did jump in the car to get to the other side of town. Portland boasts one of the largest–and coolest–Whole Foods stores ever. The selection is fantastic, and they sell wine and local spirits in a special section that comes with its own wine expert to help you make the right choices! A short hop down the road from Whole Foods is a line of distilleries and breweries on Fox Street just waiting for thirsty customers. 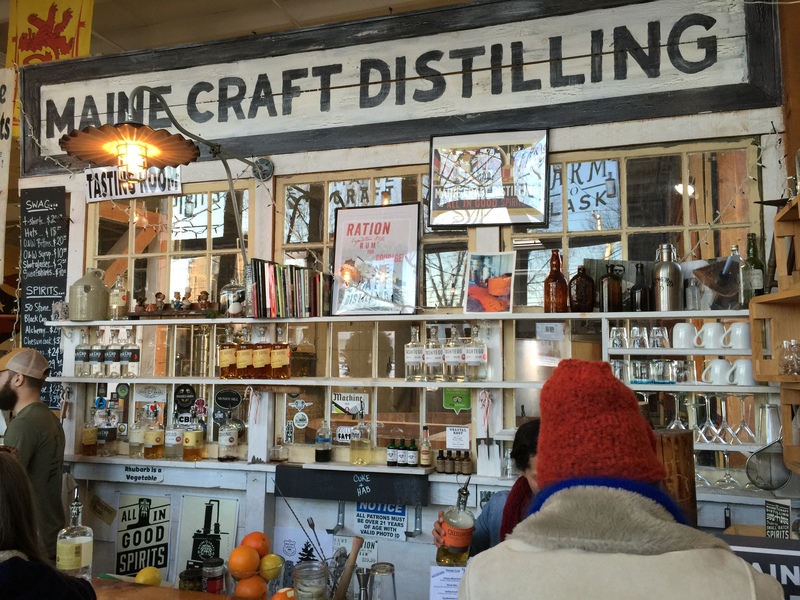 We stopped in to Maine Craft Distilling for a tasting of their creations. 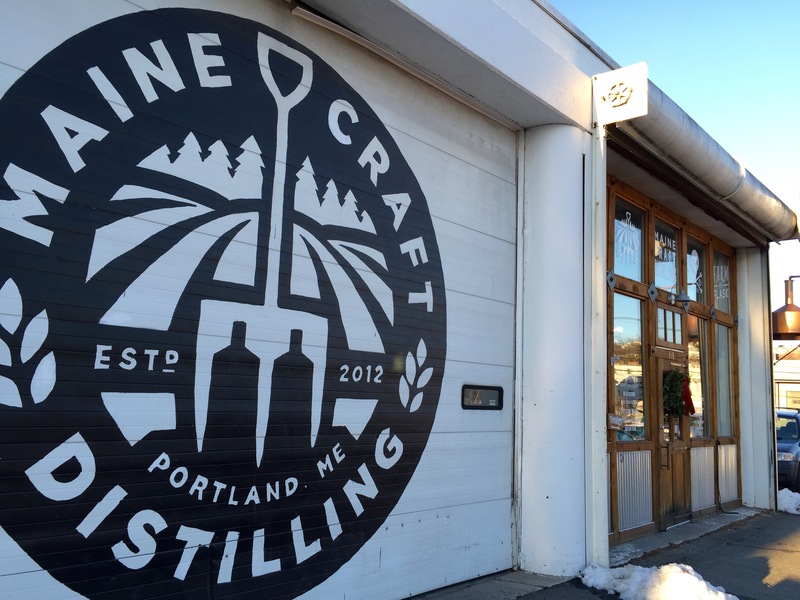 Here’s the thing that tells you you’re in Maine: we arrived at Maine Craft Distilling, and they told us they were sold out of just about every spirit because of the holidays. But they still poured us free tastings of all their booze! That would not happen anywhere else. Their logic was: if you like it, you won’t forget it and you’ll buy it the next time around. Friendly and informative, and their blueberry spirit called Blueshine, is worth a trip back. 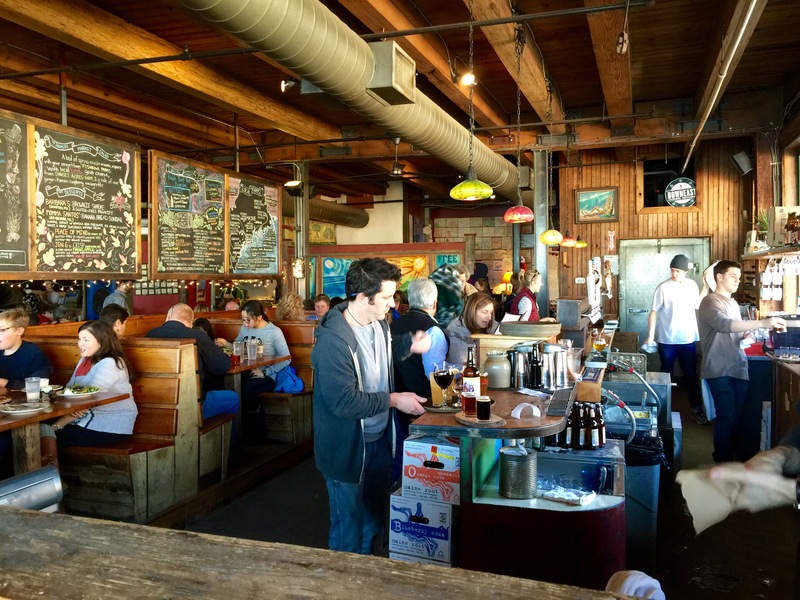 Back along the waterfront, on Commercial Street, we tucked into the Flatbread Company, a wildly popular pizza joint that now has 15 locations in Maine, Massachusetts, New Hampshire and even Hawaii. Great pizza (with gluten-free options), salads, and an awesome view of the water. Watching these talented chefs work the oven is better than television. I could watch all night! 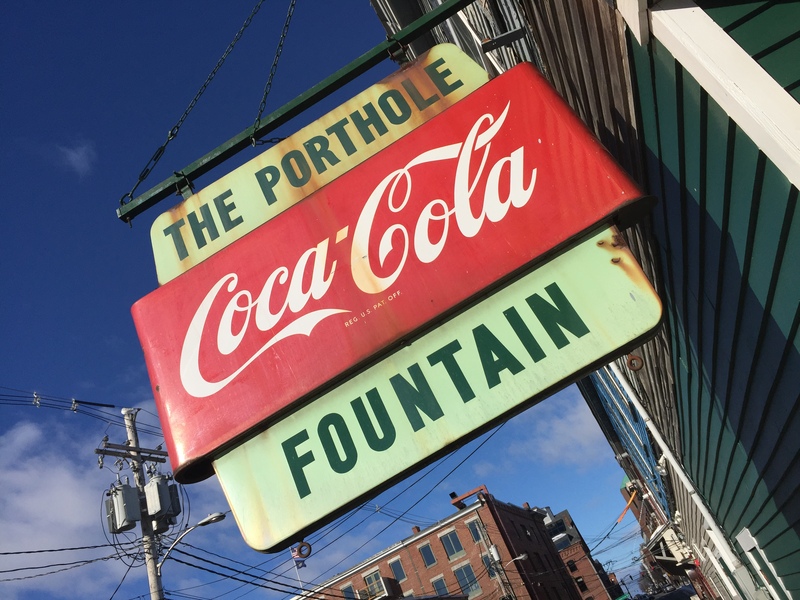 A must-stop at least once on any Portland trip is the classic Porthole. Featured on “Diners, Drive-Ins and Dives,” they open for breakfast and rock all through the night. I dropped in for some breakfast to go on New Year’s morning, watching those at the bar chug down their Bloody Marys: a little hair of the dog after a long partying night. Perhaps my biggest disappointment of the trip (and mainly because it has received so much hype from magazines and friends) was The Portland Hunt and Alpine Club. I was told not to go here for the food, so we passed on that. But while my wife and daughter spent some time in the shops nearby, I decided to go in and check the place out for a cocktail. 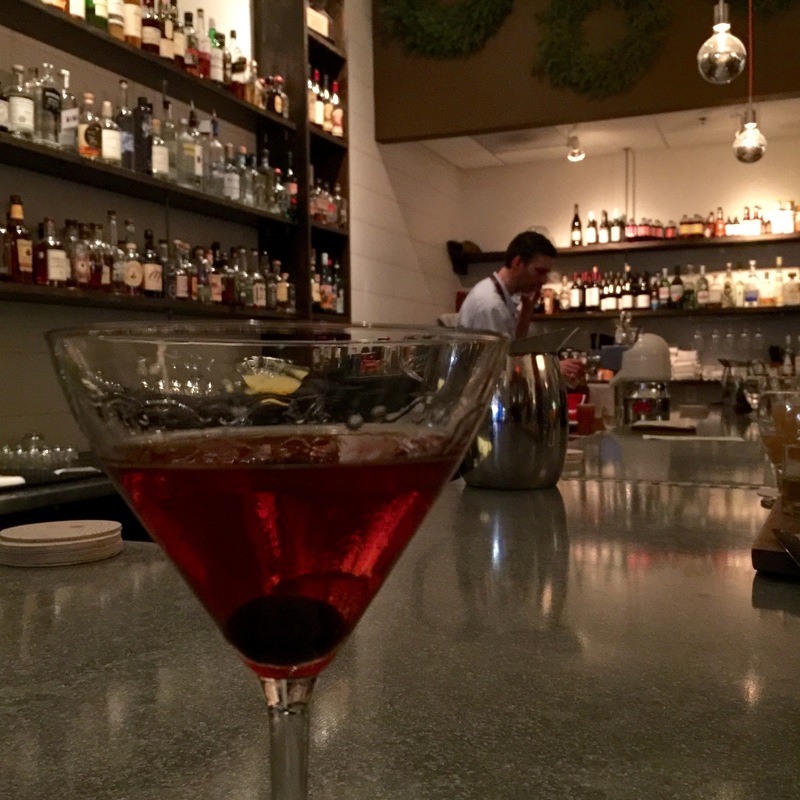 The bartender was friendly enough, and when I asked for a Manhattan with his choice of bourbon (he used Baker’s), he made it with flair and it tasted good. But it was also something I could make at home just as easily. I don’t know…maybe I needed to order something else. Maybe I should give the place a try in the light of a summer day and not a cold winter’s night. It just seemed kind of dumpy and not at all what I was expecting: uncomfortable metal benches at the bar, a stuffiness in the air like the vents in the kitchen weren’t working. I need to come back and give these guys another chance. You could say I’ve done it all in St. John. My first visit 25 years ago was a week-long stay in a tent at Cinnamon Bay campground. I returned in later years to rent villas in the Chocolate Hole area as well as Coral Bay. I rented apartments and condos in Cruz Bay. And, I’ve stayed at the Westin Resort St. John several times. 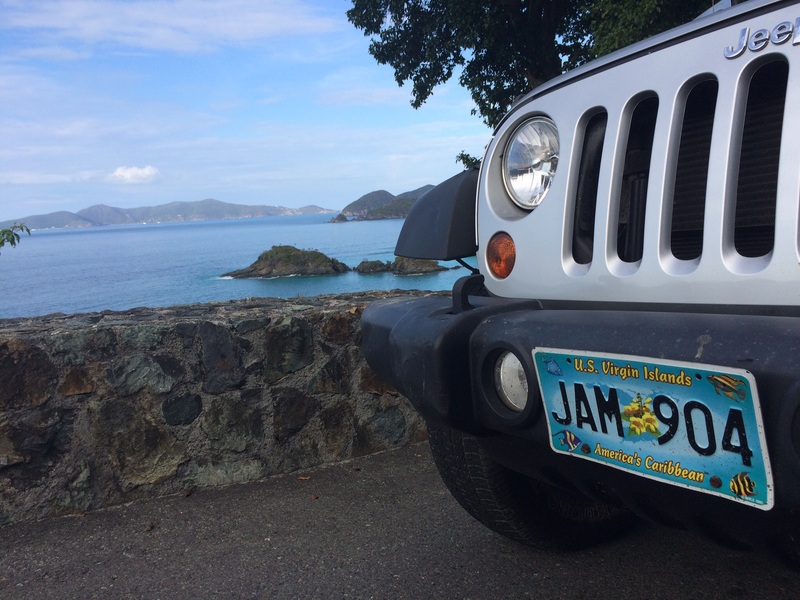 St. John has rapidly become the island of the Jeep Wrangler. You’ll find this as a rental more than any other kind of vehicle. Always reserve your car while you’re still at home, before your trip. They go fast. St. John is a small, mountainous, tropical island, one of the three US Virgin Islands. (The other two are St. Thomas and St. Croix.) The Rockefellers fell in love with this island many years ago, and established what is now the Caneel Bay Resort. More significantly, they secured about two-thirds of this island (and much of its surrounding waters) as a National Park, which means limited construction on land and no annoying jerks in loud motor boats and jet skis off shore. Those areas where construction is allowed, outside of the National Park, like the town of Cruz Bay, have seen significant growth in the last two decades, and it’s not always for the best. 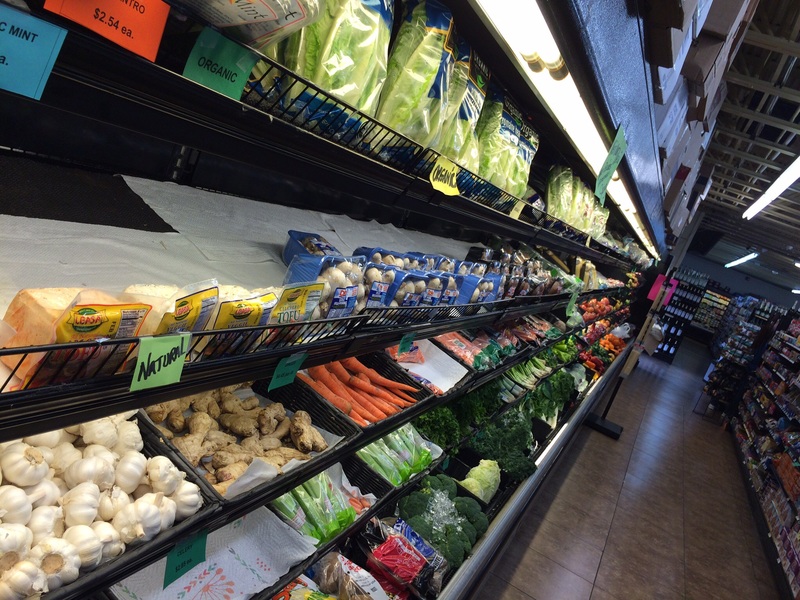 Local markets have kept up with the times, and you can now find gluten-free and organic foods easily on St. John. There’s no airport in St. John…just a helipad at the top of the island where the hospital is located. So that means everyone arrives here by boat. Vacationers land in St. Thomas and take a series of taxis and a ferry to get to St. John. Easy to do. The lack of affordable living space for locals that work here means many of them have to commute every day from St. Thomas, where the rent is cheaper. Talk to most store or restaurant owners and they’ll tell you that they came to St. John on vacation and decided this was where they wanted to stay. I can’t say that I blame them. And if they had a radio station here, I’d be really tempted to do the same! 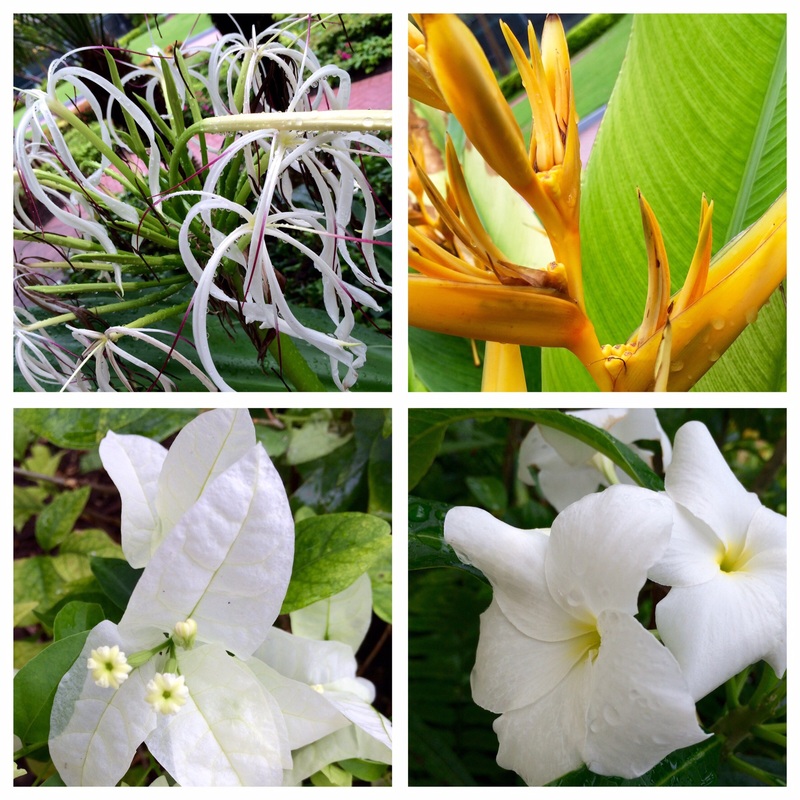 Some of the flowers at the Westin. 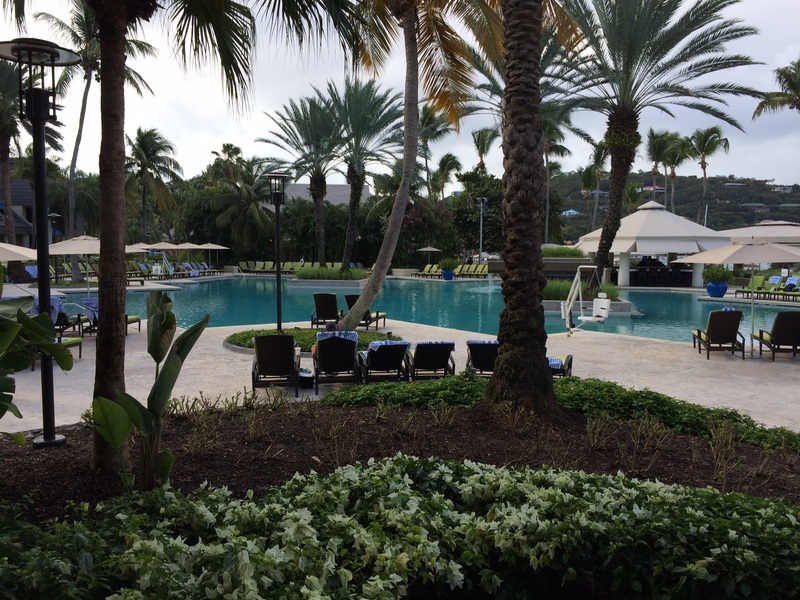 We were here once again on Starwood points and got a poolside room with King-size bed and a roll away for our 8-yr-old daughter. The room was clean and comfortable, and housekeeping was there every day to make sure we had plenty of clean towels. The push is definitely on to get you to see their time share properties, and so the sales pitch was annoying at times. But it didn’t take away from our enjoyment of the property. My daughter loved the Kids’ Club (gives parents some private time.) My wife loved the spa. The staff of the dive shop was helpful in guiding us where to go snorkeling on the island, depending on water conditions. Nothing, I mean nothing, beats the private Westin ferry service that takes you from the airport to the resort and back again without any stress or hassle. After two-and-half decades, I can tell you: the public ferries and taxis can get tiresome. The Westin ferry makes you feel like a rock star. It’s $120 per adult roundtrip. That may sound steep until you realize that it takes the place of a bumpy 45-minute taxi ride in a crowded van from Cyril E. King Airport in St. Thomas to Red Hook, on the eastern side of the island….and dragging your stuff out of the van to the ferry at Red Hook that takes you to Cruz Bay in St. John…and fighting the crowds to unload your luggage and put it on a taxi that takes you from Cruz Bay to the Westin Hotel. Poolside room view at the Westin. We arrived just before winter break. It was really peaceful and serene. Then the screaming parents and their brats arrived, and it became a whole different place. (We nicknamed our next-door neighbors the Awful-Awful family.) That’s when we rented a car and explored the island for a few days, returning only to shower and sleep. If you’re a couple looking for romance, beware of holidays! I’ve listed the Beach Bar first, because it’s the first and last—and in between—place you need to be when you come to St. John. You have not officially arrived until you’ve had a drink here. Nothing fancy. Just a bar along the beach with good bar food. But at night, the Beach Bar jams with live music of every kind, and it’s the most fun you can have in Cruz Bay with your pants on! 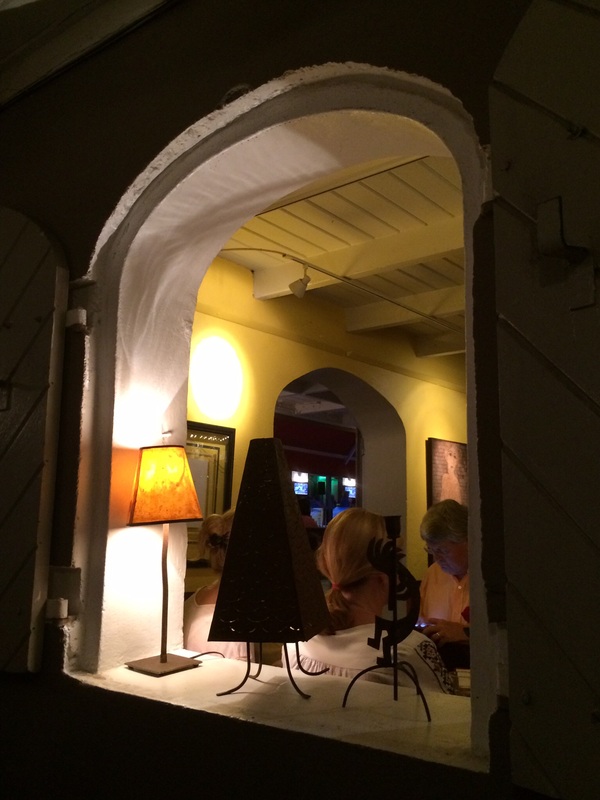 I have walked back–okay, stumbled back–to my condo many times from the Beach Bar in the last 3 decades. Like I said, it’s the first place I go to when I get to the island, and where you’ll always find me on my last night before I head home! Everyone comes here: singles, couples, families. No worries. 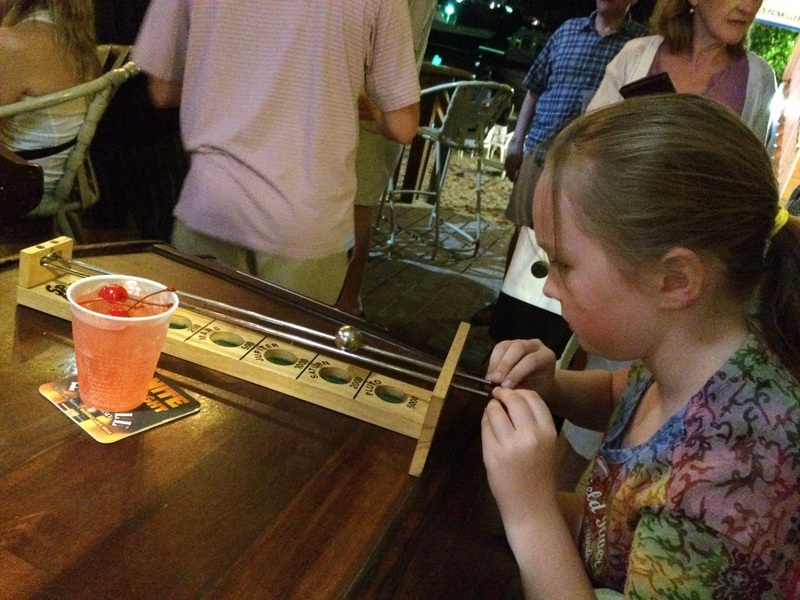 Bar games powered by Shirley Temples at the Beach Bar. Our choice for #1 restaurant on the island. We go to La Tapa every time we’re in St. John, and the food and service is always outstanding. This is where you go for a romantic dinner or a nice quiet time with the family. This is where you go when you’re tired of fritters and Caribbean tastes and you’re craving a high-end dining experience. Wonderful wines, well-made cocktails. Deliciously fresh gazpacho. An intriguing cheese plate. 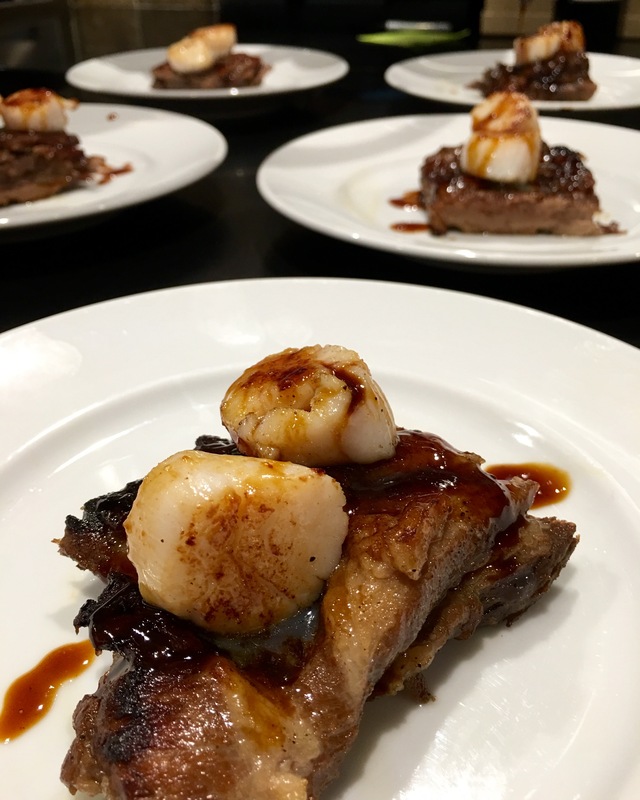 Foie gras and pork belly (what’s not to like?) House-aged steaks. Tasty desserts. 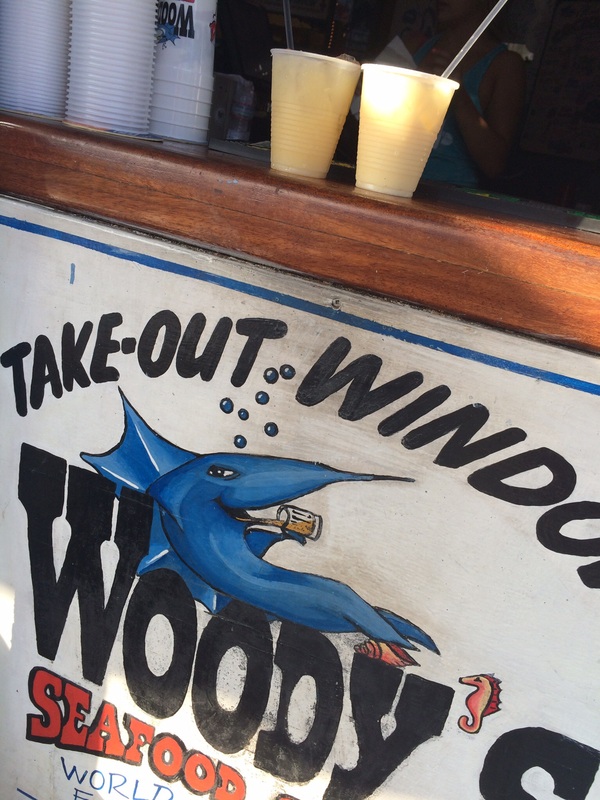 Located right next to Woody’s, you could say that these two places are the opposite extremes of the St. John experience. Both great in their own, very different ways! 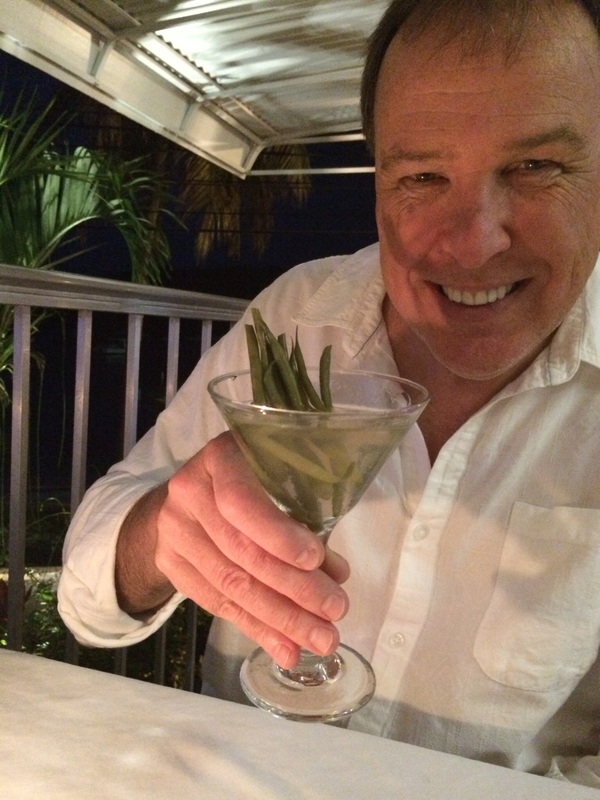 A bean martini at the Terrace, featuring house pickled haricot vert. This wasn’t just excellent for St John. It was truly excellent. Inventive cocktails, like a martini with house-pickled haricot vert…foie gras…fresh monk fish…beautiful aged ribeyes…and more. 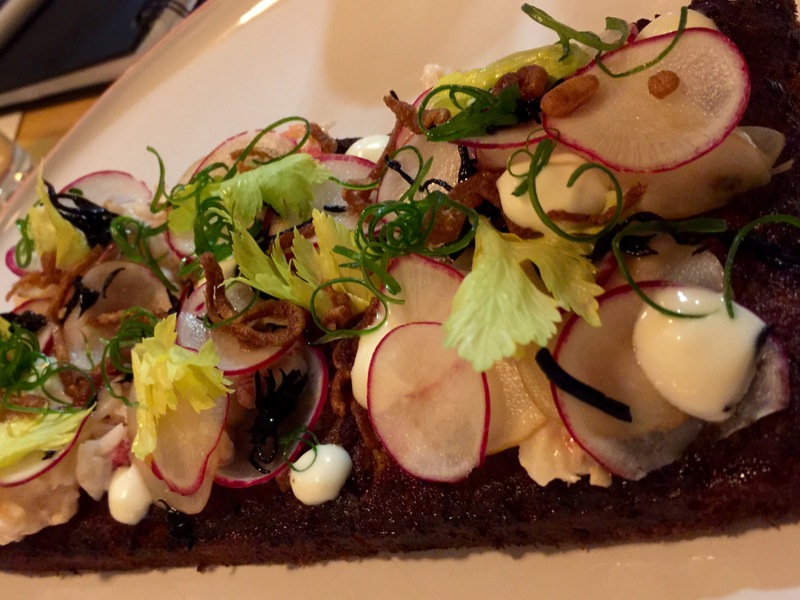 Sophisticated flavors and combinations found in big city restaurants back home. No kids’ menu, but that’s OK. They made a wonderful dish of pasta with tomato sauce for our daughter. Knowledgeable and friendly service, quiet atmosphere despite their location across the street from the Beach Bar. Family friendly as well as a great spot for a romantic dinner. Reservations a must. 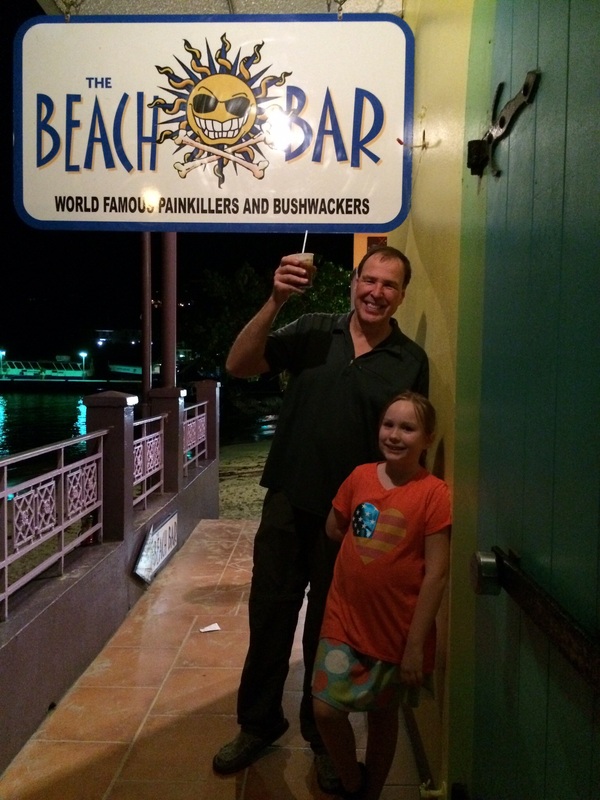 #2 of our favorite restaurants on St John. 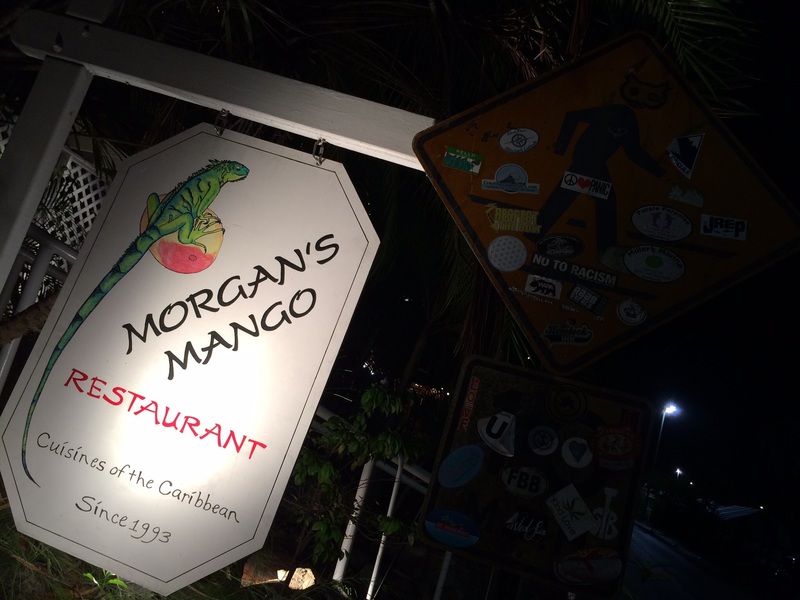 Morgan’s Mango is a lively place where you can get a great cocktail and feast on wonderful Caribbean flavors. When you’ve just arrived in St. John, this is exactly what you want! I’m glad we came here first, because after several days of similar food, we started looking for a change of pace. But what they served us, they did well: tuna tartare, Caribbean ceviche, grilled mahi and more. Look for the sign outside…it means they’ve got fresh lobster that day! If you’re looking for a quiet night out, this is not the place. People are here to party and enjoy some great food. Morgan’s Mango delivers. Our #3 choice overall and best choice for local flavor. The first sip. At Morgan’s Mango. Not a bad place. What the server lacked in skills, she made up for in genuine friendliness. What makes this place special is that you’re on the water in Cruz Bay, and any restaurant that has that going for it is going to do well. Basic salads, okay apps, familiar entrees. 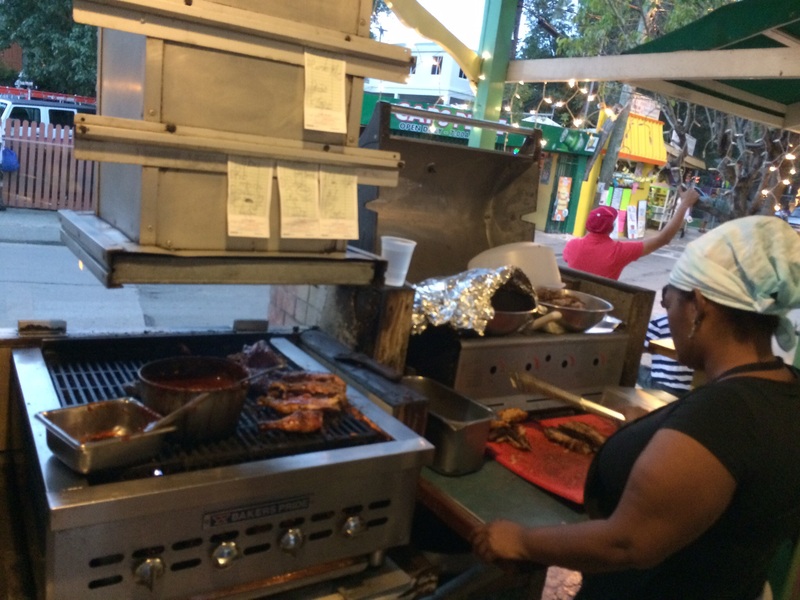 Located right in the center of Cruz Bay, in the large parking area across from the Post Office, there’s a small covered seating area with an equally small cooking space known as Uncle Joe’s Barbecue. The wait can be excruciatingly long, and in the old days, it was worth it. But we haven’t been here in 5 years, and it seems to me that the recipe, maybe the ownership, maybe the staff, has changed. Believe me, it’s not bad. But it just didn’t match the memory I had of it. And you better be OK with “island time” to eat here. Place your order, and go shopping. Come back in an hour, and maybe it’ll be ready. If not, go back out and shop some more. That’s the way it goes at Uncle Joe’s. Good ribs and chicken, just not what it used to be. 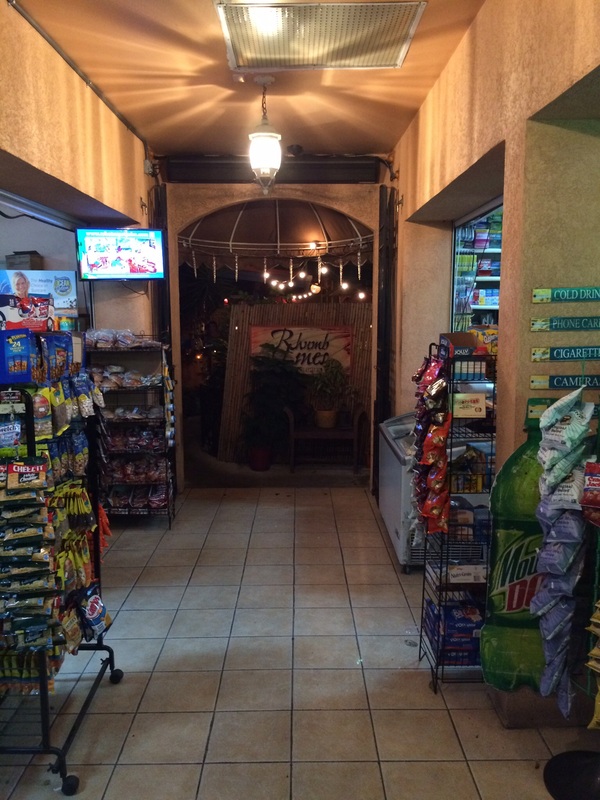 The strange entrance to Rhumb Lines: through a convenience store. Probably the most disappointing dinner on our entire trip to St. John. This place was recommended by several friends and we found the food to be just plain bad. When the best thing at the table is your kid’s chicken tenders and french fries, you know you’ve got a problem. The atmosphere is fun and energetic, but all of our dishes were a real disappointment: summer rolls (flavorless), pot stickers (burnt), pad Thai (like out of a can), Cuban pork (mystery meat.) All served very quickly, to get you in and out as soon as possible. Thank goodness for cocktails and a decent bottle of wine. In all honesty, St. John is not a foodie mecca anyway. So it wasn’t surprising to find this place packed nonetheless, especially during winter vacation week. But there are better places to eat in Cruz Bay. I would suggest sitting at the bar, and having a drink just to soak in the fun atmosphere. Then go eat somewhere else. You’re not going to get fine cuisine at Woody’s, but you’ll realize that the minute you see it. Crowded, loud, and absolutely insane, it is all about Happy Hour. And it’s a landmark you’ve got to visit, even if it’s just once. Besides, where else can you get a couple of Painkillers to go at their outdoor service window? And they make theirs with Cruzan rum, not Pusser’s. I prefer their recipe. Cheers! 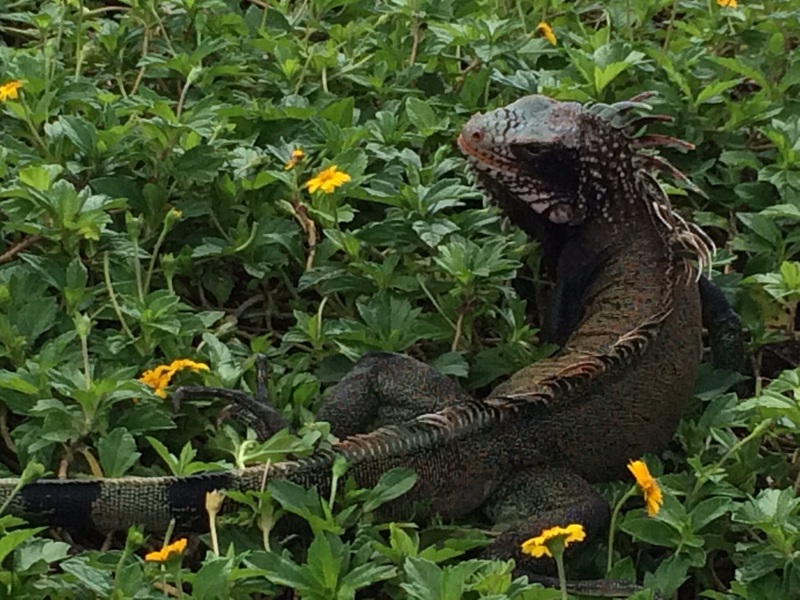 Donkeys, cows, iguanas, even mongooses roam the island. 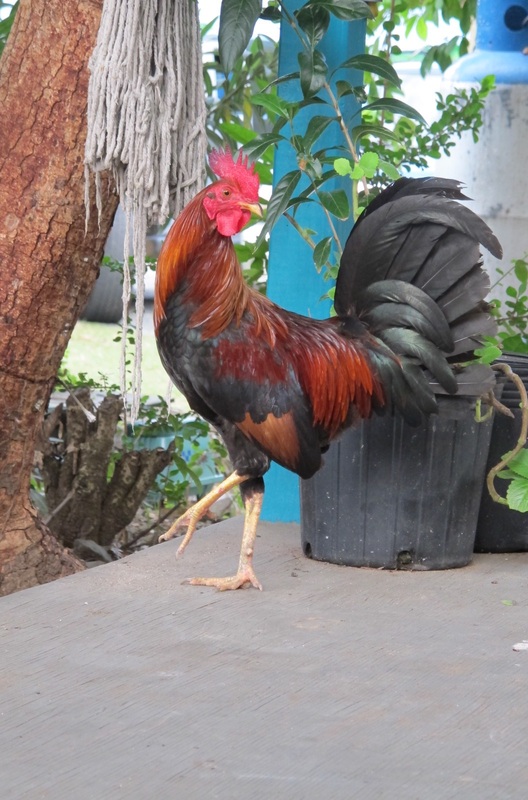 And the roosters pose for photos. This is what you do when you go to Coral Bay. You support the locals that are working hard to feed their families by feeding you a taste of their culture. Over the years, we’ve seen this little place grown from a trailer to a quaint outdoor restaurant, and the food has always been wonderful and served with a smile. On our last visit, we did the Sunday brunch, which consisted of a buffet with pork ribs, curried goat, mahi, jerk pork, and more. Everything other than the mahi, which dried out on a buffet table, was excellent. We washed it all down with a beer and their homemade sorrel drink. 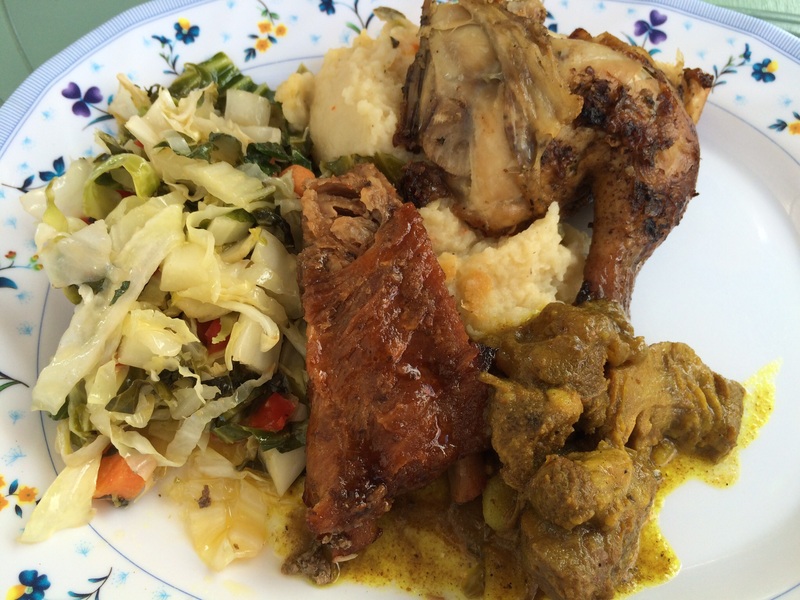 Sunday brunch: ribs, mahi, chicken, curried goat, and veggies. 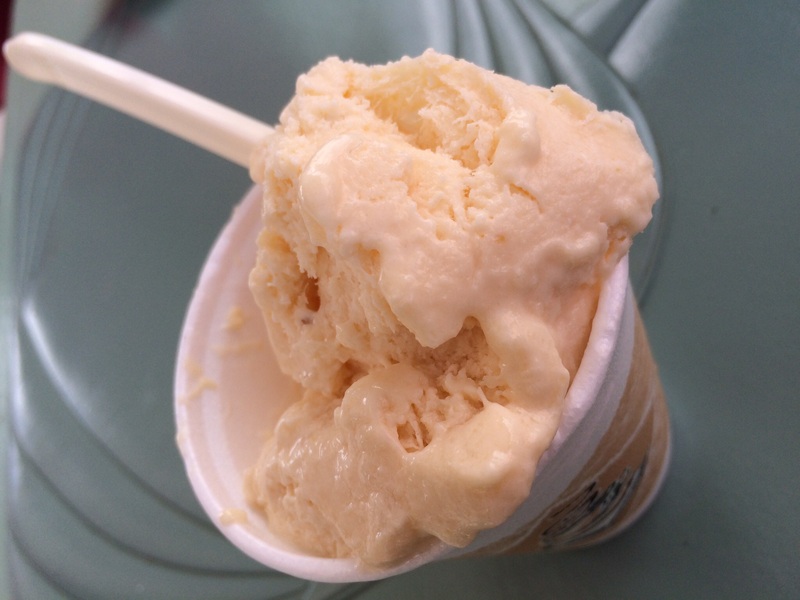 And for dessert, the homemade soursop ice cream was a special treat. If you’re in Coral Bay, you can’t miss this place. Stop by, and if you can’t dine in, get some take-out for the beach. There’s nothing horribly wrong with Shipwreck Landing. It’s just not great. In an area like Coral Bay, where the food choices are limited, you could do worse. We chose it as our dinner spot for Valentine’s evening and the food was mediocre at best. As I’ve said before, you don’t come to St. John for the food…and if you do, you stay in Cruz Bay. We take our dinner more seriously than our lunches, where Shipwreck has been fine with salads and burgers. But none of the dinner entrees we had (fish, steak) really impressed us. Coconut shrimp was overcooked and tasted like it came out of a box. Who cares, I suppose. It was snowing back home and we were in St. John! 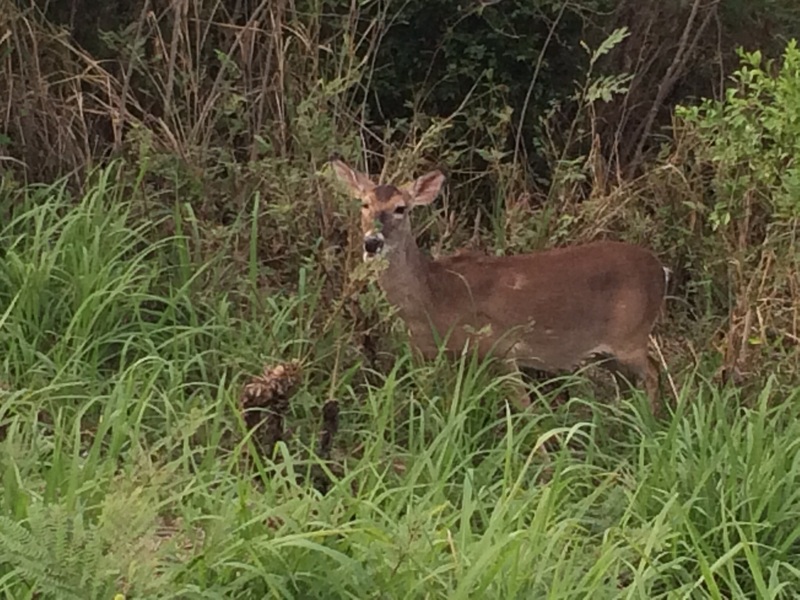 You can even find deer on St. John. Maybe this means venison on someone’s menu soon? 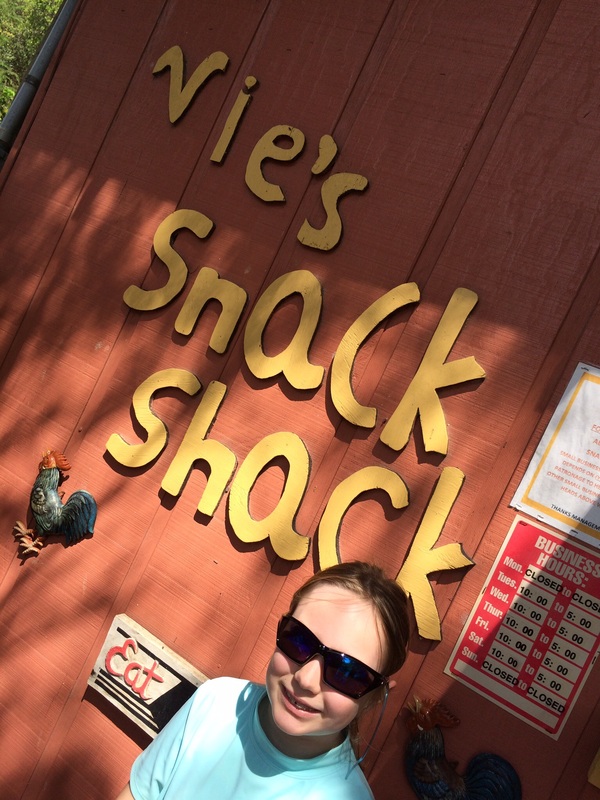 My first visit to Vie’s Snack Shack was 25 years ago, when Vie herself ran the shack. Back then, the shack was open when Vie felt like it, and I was lucky enough to catch it almost every time I was on the island. Now, years later, the shack is run by her daughter, and she keeps regular hours…something the average tourist can appreciate! (They’re open Tuesday thru Saturday from 10 to 5.) The garlic chicken is still fantastic, especially when you drizzle honey on top. Same with the Johnny cakes. But nobody, and I mean nobody in St. John makes conch fritters like Vie’s! Worth the car rental and drive out to the boonies just for that! Plus, for a mere $2.50 per person, you can swim at Vie’s private beach, which is on a beautiful cove with decent snorkeling. The definition of the good life. 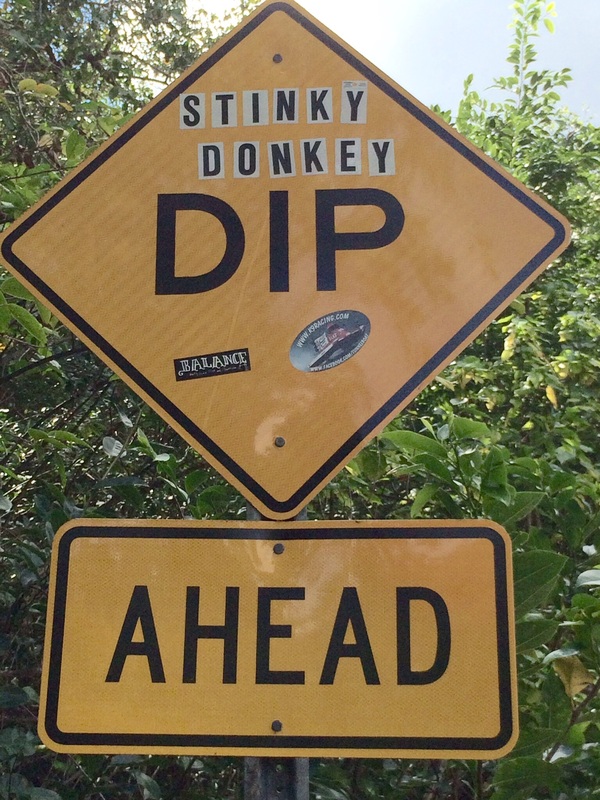 Fun to see how many customized “Dip” signs you can spot while driving around the island. Skinny Legs: Where the Coral Bay locals go. It can get pretty rowdy in here, but families are always welcome. Great burgers, cheap drinks. You can smell the grill a mile away! Miss Lucy’s: Famous for their full-moon parties, it’s just past “the main drag” in Coral Bay. On the water, and lots of fun, with a Caribbean flavor. 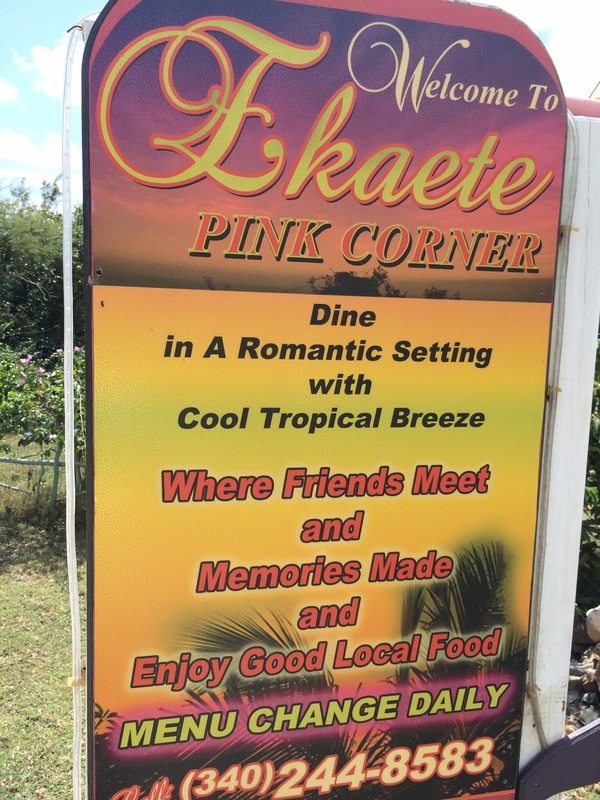 Asolare: At the top of the hill as you leave Cruz Bay to head to the north shore, and a favorite for dinner at sunset. Good food, not great, but the views are spectacular. Used to be that none of the beaches on St John had services like snack bars, showers and bathrooms. Now some do. The ones that do are always the most crowded and that’s why I avoid them. But you certainly can’t go wrong with any beach on St John! Taxis will take you just about anywhere if you don’t have a car. Money shot: a view of Trunk Bay from the cliffs above. Trunk Bay: If it’s your first trip to St John, especially if you have kids, you’ll want to go to Trunk Bay to see the underwater snorkeling trail. Unfortunately, that’s what the cruise ships do as well, so talk to your hotel and find out when the crowds are less likely to be there. Hawksnest Bay: The first public beach you see on the north shore. Small beach, good waves. 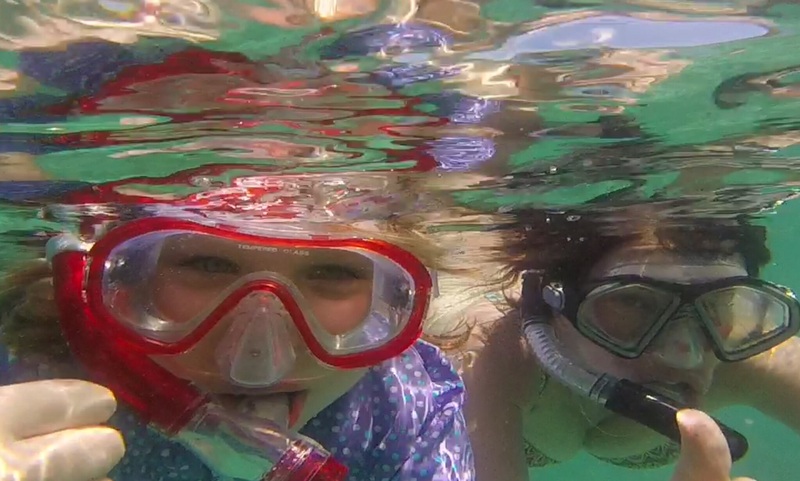 A great place for kids to learn how to snorkel! 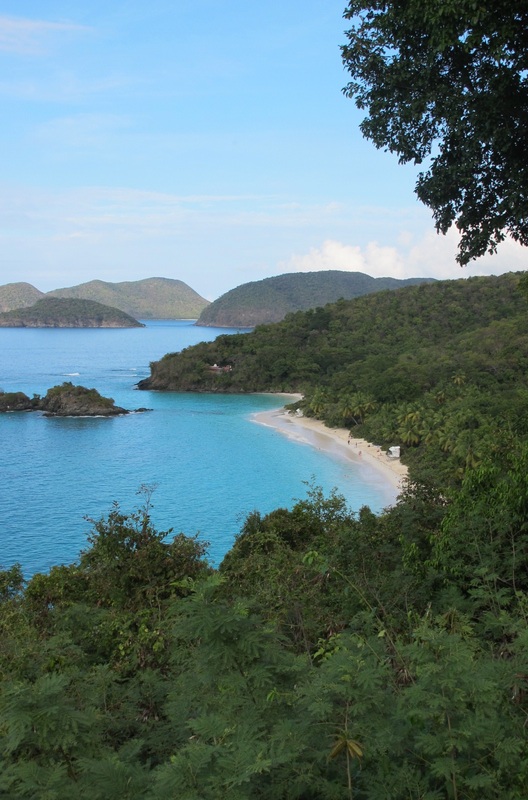 Cinnamon Bay: It’s a campground, with a restaurant and a convenience store…and a beach. Where I first stayed on St. John, 25 years ago, and discovered that Cruzan rum was much cheaper than a crappy can of Coors Light! I never looked back! Francis Bay: This used to be our favorite beach until they opened up a large parking lot next to it. Not only do cars fill the lot, they spill out for a half-mile onto the narrow road that takes you to the lot. Still, it’s a beautiful beach and a personal favorite. Lots of pelicans flying around. Decent snorkeling. Years ago, I had a great barbecue party on the beach here…something you just can’t do at Francis Bay anymore. Salt Pond Bay: You have to drive all the way around the island, past Coral Bay and south to get here. Then you have a hike down to the bay. But it’s worth it. Nice snorkeling, calm waters. No services. Great Lamshur and Little Lamshur Bay: If you’ve driven all the way to Salt Pond, drive a little further to the end of the road and you’ll get to the Lamshurs. About as out-of-the-way as you can get on this island, and the snorkeling can be great here. No taxis here. You need a Jeep. A sign at Honeymoon Beach. 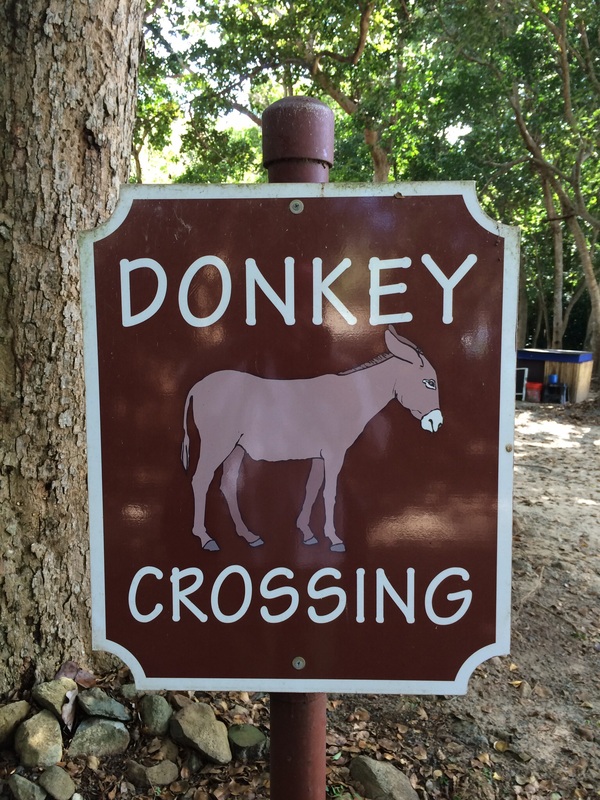 Hiking trails in this area have many wild donkeys, which were brought here in the 1600’s from Spain to help in sugar cane harvesting. Honeymoon Bay: Why we didn’t know about this sooner is beyond me. This is a beach just off the Caneel Bay resort property. 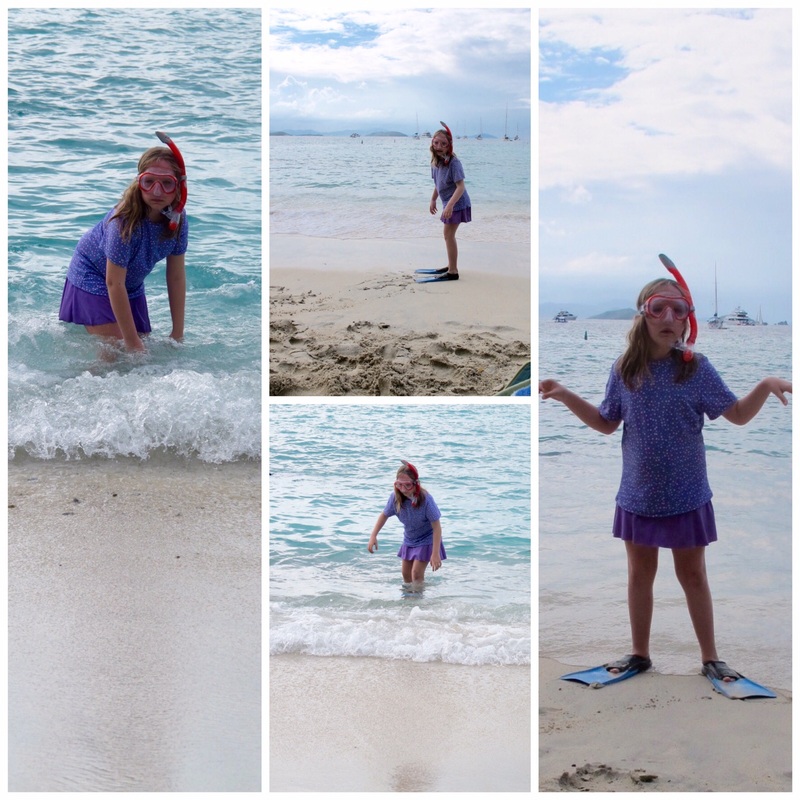 You basically take a taxi to Caneel Bay and then walk…a lot. But you end up on this beautiful beach that has a snack bar and offers some beach rentals, too. Kind of a secret beach. No matter what you need: a taxi, some information, whatever…the first thing you always say to a local, in person or on the phone, is “Hello, how are you today?” You’ll be surprised at the smile you’ll get. If you’re a U.S. citizen, you don’t need a passport to come here. 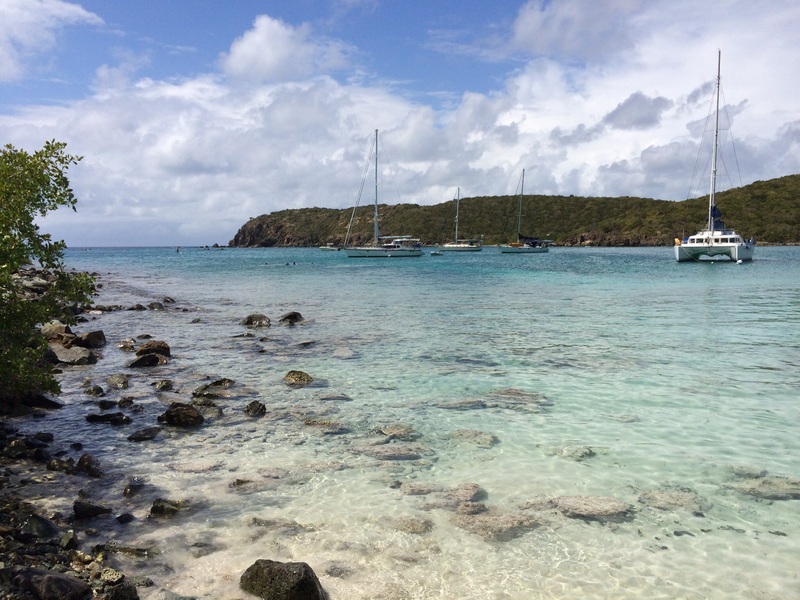 But if you decide that you want to go to the BVI at the last-minute, you will need one. So bring it anyway. 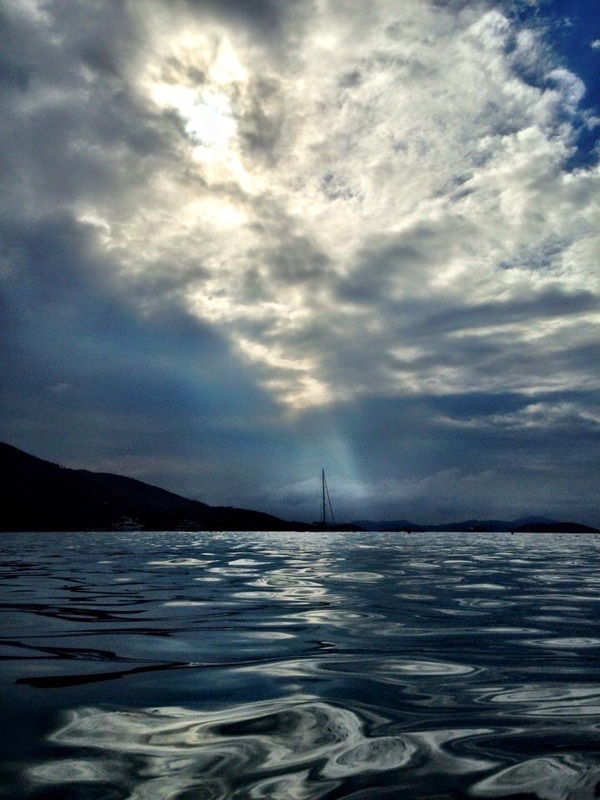 Snorkeling trips to Jost Van Dyke are awesome, and they’ll take you to the greatest beach bar on planet Earth: The Soggy Dollar, home of the original Painkiller. Also the famous Foxy’s. Just remember: it’ll cost you extra cash and time to go through customs in the BVI as well as customs back in St. John when you return. You really need a full week to appreciate St. John, but two is even better. Plan to rent a car for at least a few days if you stay in Cruz Bay. You may need it the entire trip if you rent in Coral Bay or if you’re staying in a villa that’s away from it all. Always reserve your rental car from home, way before you make your trip, or you’ll be out of luck. Explore all the beaches, especially those on the south shore, beyond Coral Bay. They’re quieter and they’ve got great snorkeling. There’s nothing on St. Thomas that you can’t get on St. John, except, crowds, traffic and obnoxious cruise ship tourists. You came to get away from it all. Stay here. Bring some of those special things you need every day from home. 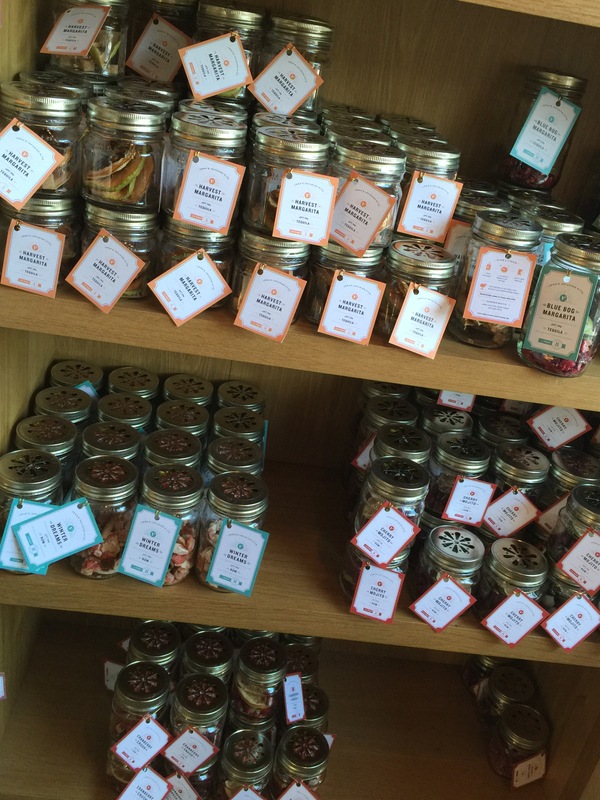 You won’t always find herbal teas or special coffees, Truvia, certain cereals, etc. But you will find what you need for the most part. Duty free booze on St. John is a great deal. And if you buy local Cruzan rum, you’ll save a ton. But beware: wine is twice as expensive as it is at home! If you’re staying for a long time and you love fine wine, it may be worth it for you to bring a case from home. Embrace “island time.” If you’re impatient, this is not the place for you. Here in Rhode Island, we have access to amazing seafood year-round. My friend Gary, is a lobster man. My neighbor farms oysters. And for anything else, the winter farmers’ market at the Hope Artiste Village in Pawtucket, RI, is a great place to pick up veggies, bread, pasture-raised meats from local farmers, and freshly caught seafood. I was on a mission to find fresh mussels, and in the process, stumbled upon fresh local bay scallops piled high on ice at the Matunuck Oyster Bar booth. (www.rhodyoysters.com) Unlike like the larger sea scallops or bomster scallops, bay scallops are small and sweet, about the size of a mini-marshmallow. The first place my wife and I ever had a raw scallop was at Mills Tavern, one of our favorite restaurants in Providence, RI. 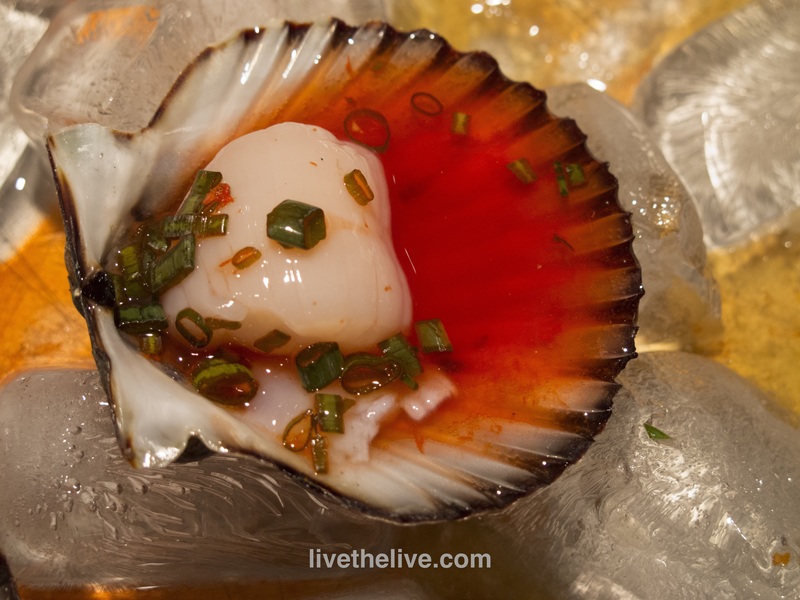 Freshly shucked scallops (in large flat shells) were served on ice with a tangy red marinade. We never got the recipe from the restaurant, but this is our version of that marinade. Combine all the ingredients and chill before using. 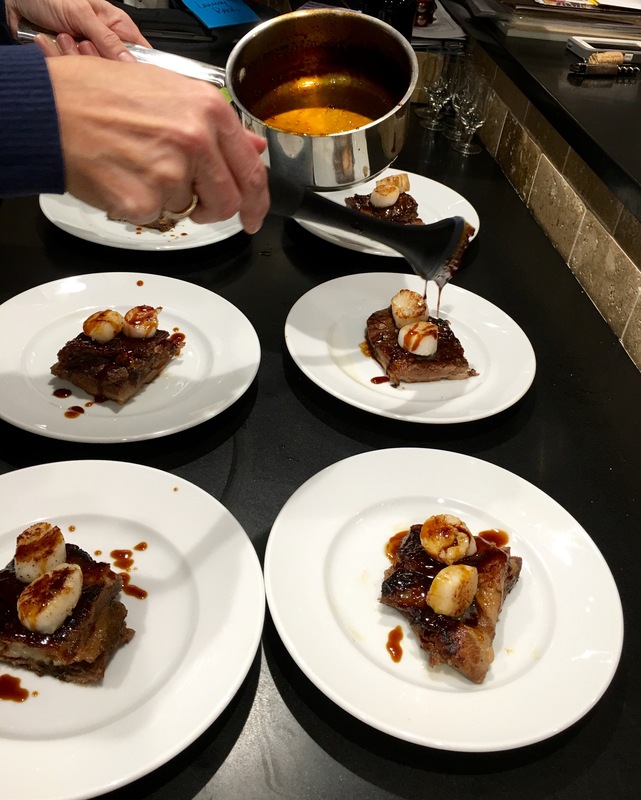 Open the scallops, clean them, then place a small spoonful of the marinade on top. Combine all the ingredients and chill before using. You can simply spoon a little bit on your seafood and eat, or submerge the seafood in the marinade, which will “cook” it after a couple of hours in the fridge. Combine all ingredients in a bowl. Mix well. Keep refrigerated. 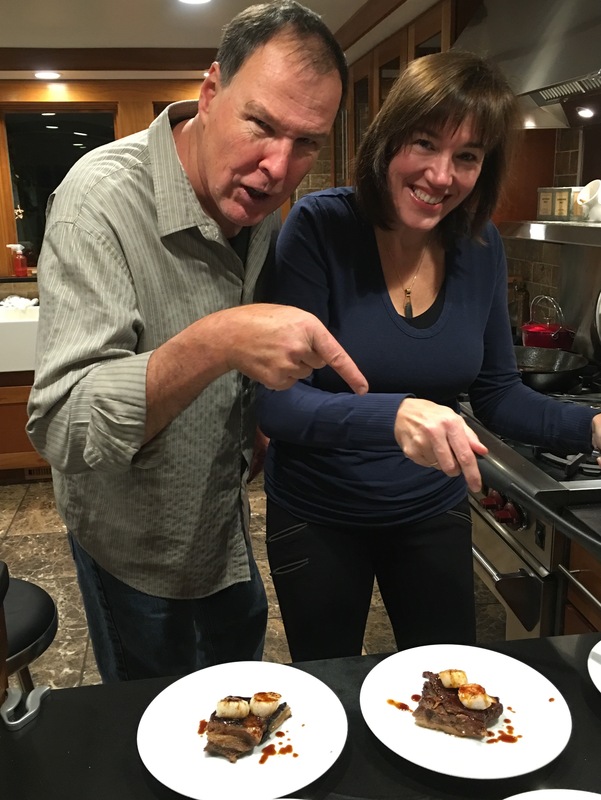 I’ve been asked to list my sources for the organic, pastured, wild-caught or grass-fed foods I use in my recipes. I’ve had many successes as well as many failures with purveyors of foods over the years, but I’ve been able to find a handful of websites that deliver what they promise. Of course, I support my local farmers. And if they’ve got the product I’m looking for, I will buy from them first. But the convenience of ordering from home is unbeatable…and sometimes you don’t live anywhere near a farm that can supply you with what you’re looking for. My philosophy is simple: I will pay top dollar if the quality is there. I would rather eat exceptional quality meat and seafood rarely than antibiotic-laced, hormone-injected crap every day. When it comes to seafood, I buy wild-caught (line-caught in the case of fish) American products. I’m OK with some farmed fish, like USA catfish and trout, which are of high quality. I buy Pacific cod, not Atlantic cod, which has been depleted in its numbers. I don’t buy orange roughy or Chilean sea bass because of overfishing. Same with swordfish unless it’s local and line-caught. I never buy farmed shrimp from Asia or South America, where there are no rules about what they feed them and how badly they crowd them in nets. 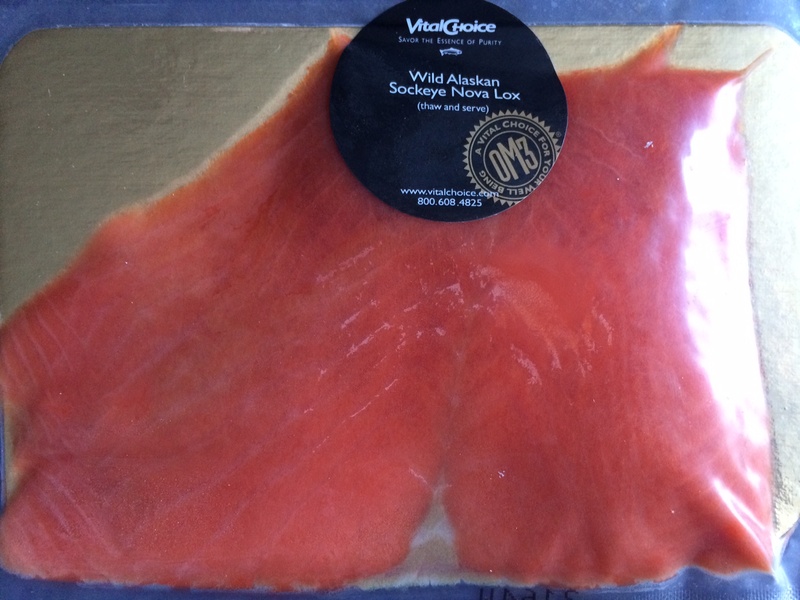 I don’t buy Atlantic salmon, which is farmed and comes from Norway, Canada or South America. I buy wild-caught Alaskan salmon and halibut. 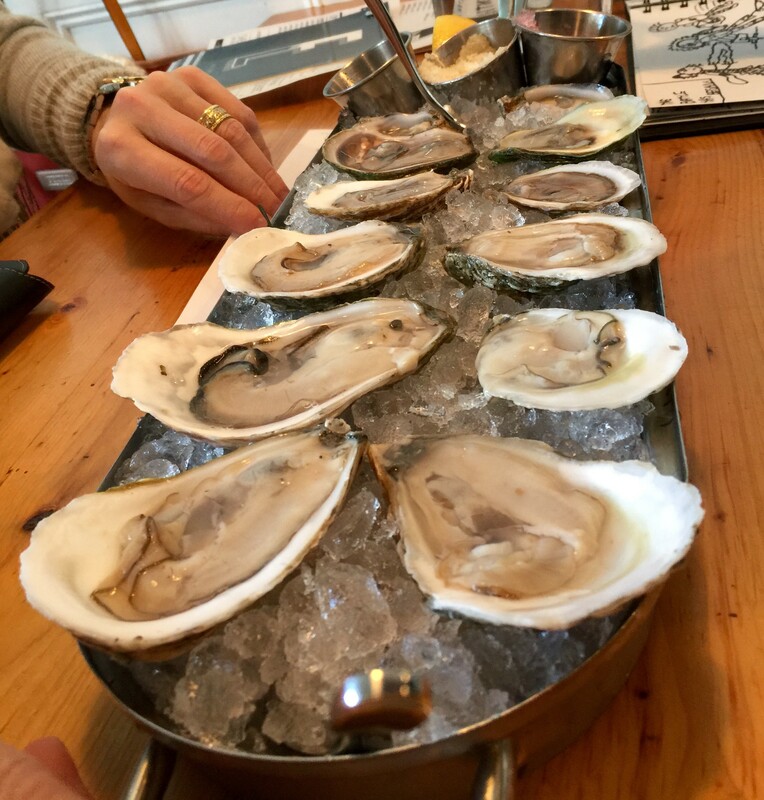 Farmed oysters and mussels are fine, because their habitat is about the same as in the wild, and we have great sources for them here in Rhode Island. It’s expensive to eat well. My family is worth it. I cut corners elsewhere. www.tallgrassbeef.com: Owned by TV journalist Bill Curtis, they sell a variety of 100% grass-fed beef steaks, burgers and dogs. Just recently, they started selling my favorite cut: the porterhouse. But more than anything, this is my go-to website for grass-fed hamburger. They sell them in 1 lb. bricks, and I’ll buy about 24 lbs. at a time. I prefer the bricks over the pre-formed burger patties, because I use them for meatballs and tacos…not just burgers. Best burger I’ve had. 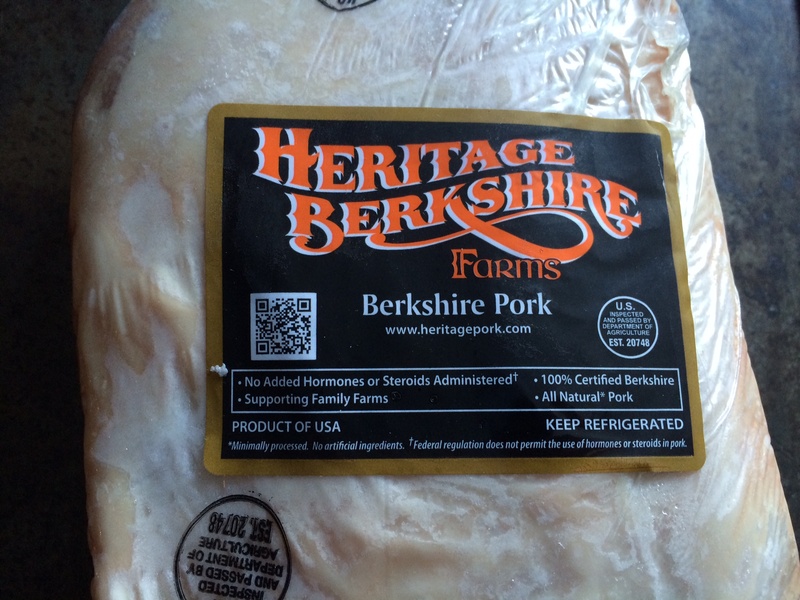 www.heritagepork.com: A great website for Berkshire heritage pork. This is not the pale, flavorless stuff you get in a supermarket. Berkshire pork is known in Japan as Kurobuta pork, and is considered the “Kobe” of pork. Excellent quality, beautifully marbled fat, and delicious. I’ve bought the pork chops, the ribs, pork loin and the pork belly, and none of them has disappointed. Excellent service. www.westwindfarms.com: Without a doubt, some of the best chicken I have ever had in my life comes from this family run farm in Tennessee. Delicious not-too-big (about 4 lb.) birds. And their chicken wings are the best ever–period. No scrawny wings here: they come with breast meat attached, making them a real treat. 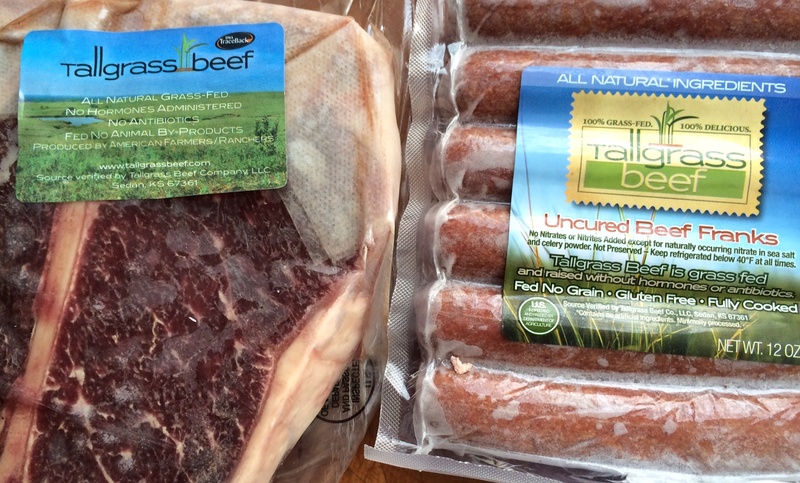 They also sell grass-fed beef, lamb, pork, organic products and more. I’ve tried their other products, but for me, it’s all about the chicken. If you’re in Tennessee or Georgia, they have many pick-up locations to choose from. I go the mail-order route, and I think I might be their only online customer! But their service is top-notch. www.cajungrocer.com: My trusted go-to place for any Cajun food you could want, from Turduckens (excellent quality) to alligator sausage, to live crawfish (in season.) This is where I get all of my wild-caught American gulf shrimp. Even with shipping costs, their prices are so much better than any local seafood store. Excellent service. www.smokehouse.com Burgers’ Smokehouse has been around since 1952 and they’ve got it down to a science. You won’t find grass-fed or organic products here, but you will find great bacon, ham, turkey and other smoked products. 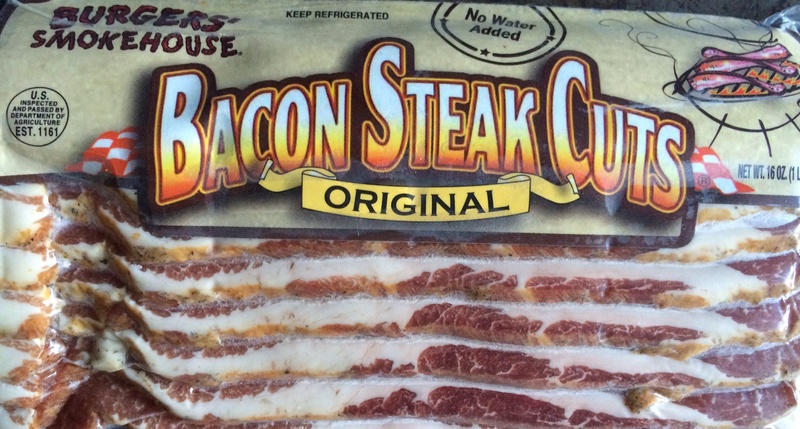 Their Thick Original Country Bacon Steak is what I always buy…12 lbs. at a time. Their cooked and spiral sliced country ham is a real treat. Not only is their service awesome, but unlike other websites that surprise you with crazy shipping costs after you’ve spent an hour getting your order together, all of Burger’s price include shipping. That rocks! http://www.mcallenranchbeef.com: Beef of the highest quality and outstanding flavor, although not grass-fed. This historic Texas ranch, established in 1791, has been dealing with droughts which have limited their supply of beef, and their website says their beef supplies will be back to full speed by June of this year. www.grassfedbeef.org: This is the website of Tendergrass Farms, a supplier of grass-fed beef, pastured pork, and organic meats. We’ve had some success with the beef, and we also purchased a very tasty turkey from them for Thanksgiving last year. 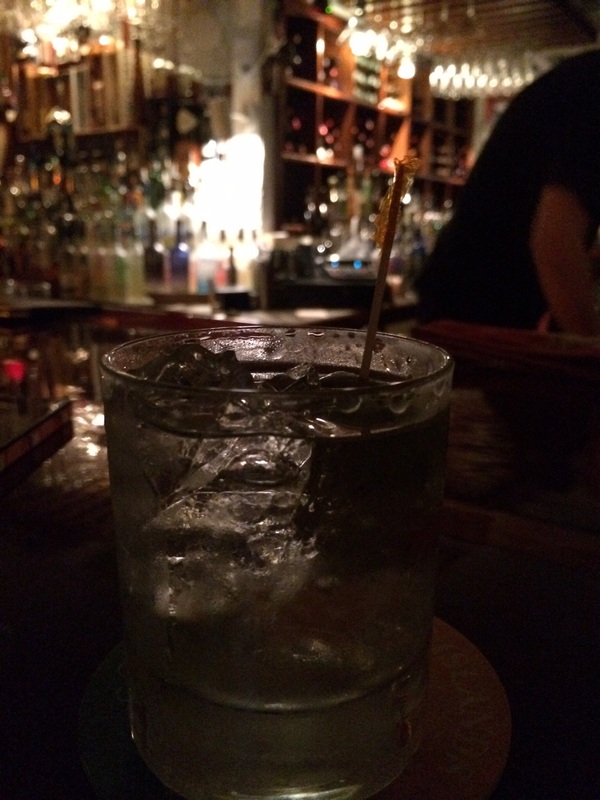 www.drinkupny.com: It’s time for as drink! And these guys, based in Brooklyn, NY, have just about anything you could want. 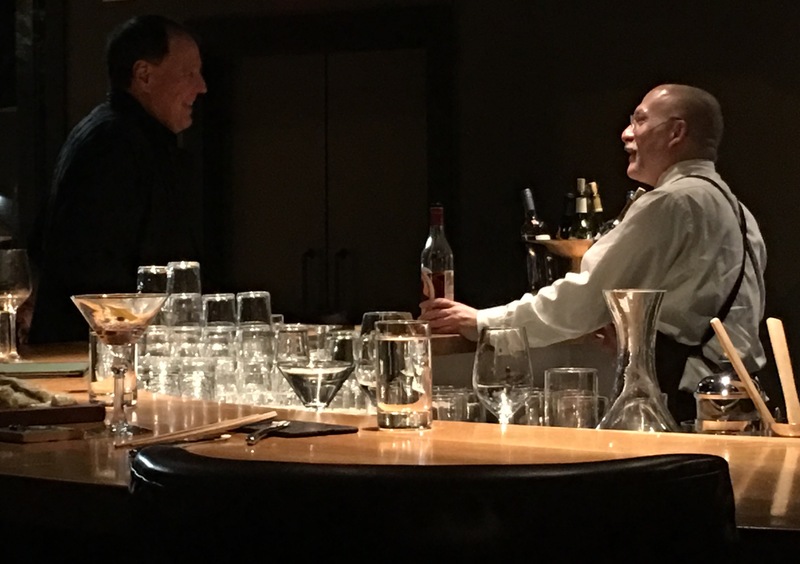 It may seem silly to order your spirits online instead of going to your local liquor store, but these guys have the high-end things my local guy doesn’t…and they’ve got better prices on the stuff he does have. Shipping is fast and reasonably priced. www.empirewine.com: Need wine? These guys are based in upstate NY and they’ve got a huge choice of excellent wines at great prices. Shipping is FAST, but make sure they ship to your state to avoid disappointment. Coming in a future blog: my sources for the gardening season: seeds, plants and more. Here in Rhode Island, we have access to amazing seafood year-round. My friend Gary, is a lobster man. My neighbor farms oysters. And for anything else, the winter farmers’ market at the Hope Artiste Village in Pawtucket, RI (www.farmfresh.org/food/farmersmarkets_details.php?market=29) is a great place to pick up veggies, bread, pasture-raised meats from local farmers, and freshly caught seafood. I was on a mission to find fresh mussels the other day, and in the process, stumbled upon fresh bay scallops piled high on ice at the Matunuck Oyster Bar booth. 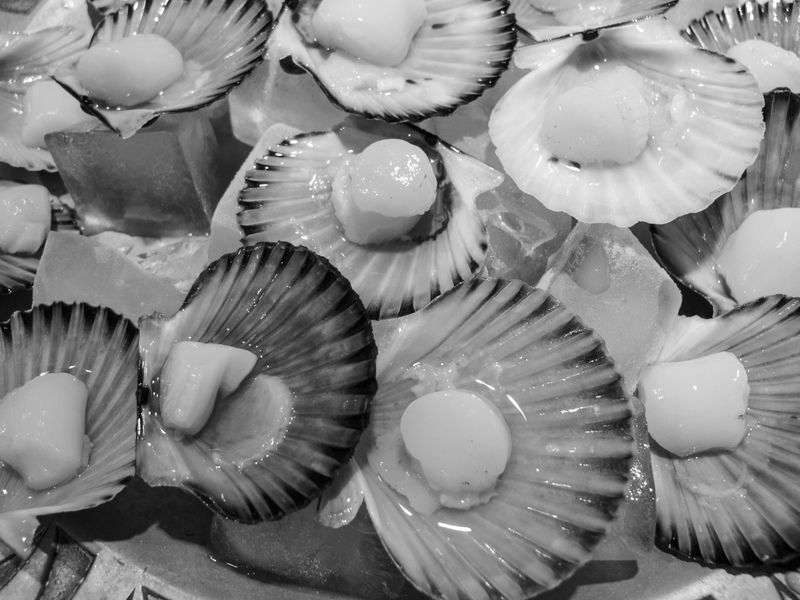 (www.rhodyoysters.com) Unlike like the larger sea scallops or bomster scallops, bay scallops are small and sweet, about the size of a mini-marshmallow.